On our second to last day in Saguaro National Park, we went to a “Star Party” at Rincon Visitor Center. We like astronomy, planets, and stars, so we made sure to go. Before going outside to stargaze, the ranger at the visitor center gave us a rundown on the history of the park. He explained how the park was created by President Herbert Hoover as a National Monument. 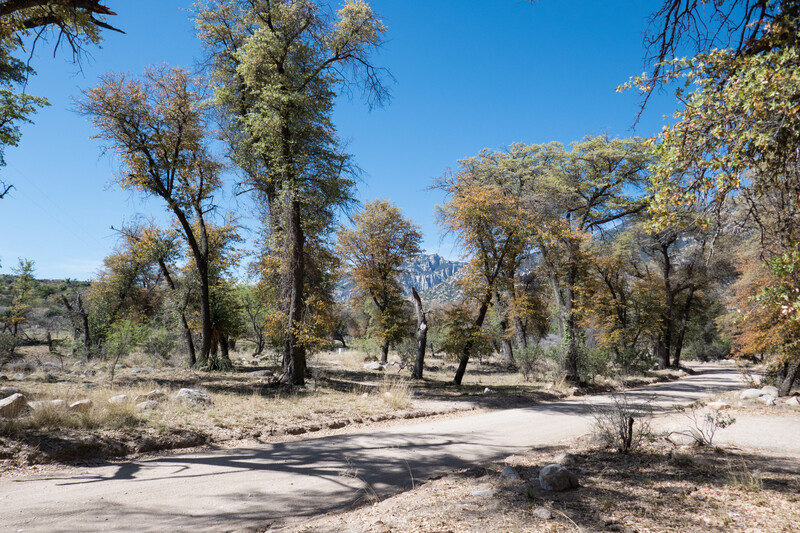 The ranger then said, “The park has a lot of diversity, not just the desert environment, but also the Rincon Mountains at 8,000 feet. Up there is Manning Camp, but nobody really goes there.” We sat there feeling slightly miffed, but also smug, because we had been at Manning Camp just two days before. 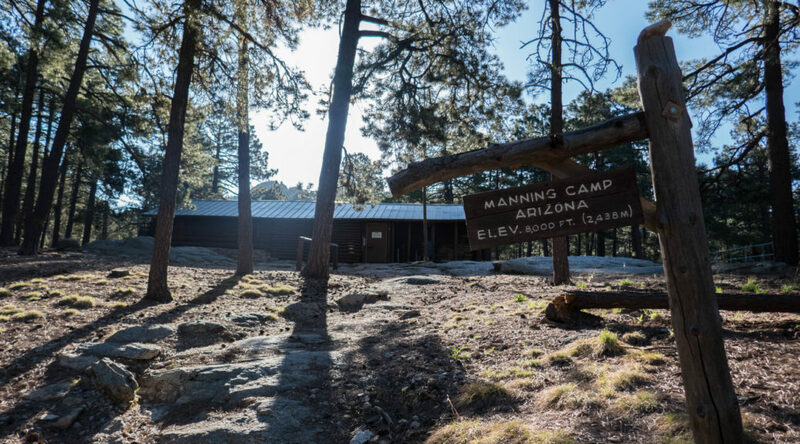 While researching Saguaro, one spot stood out more than anything else: Manning Camp. This campground sits among conifer forest at 8,000 feet of elevation, in the Rincon Mountain (east) District close to the highest point in the park. There’s a cabin at the campground that was built in 1905 by Levi Manning, a mayor of Tucson. 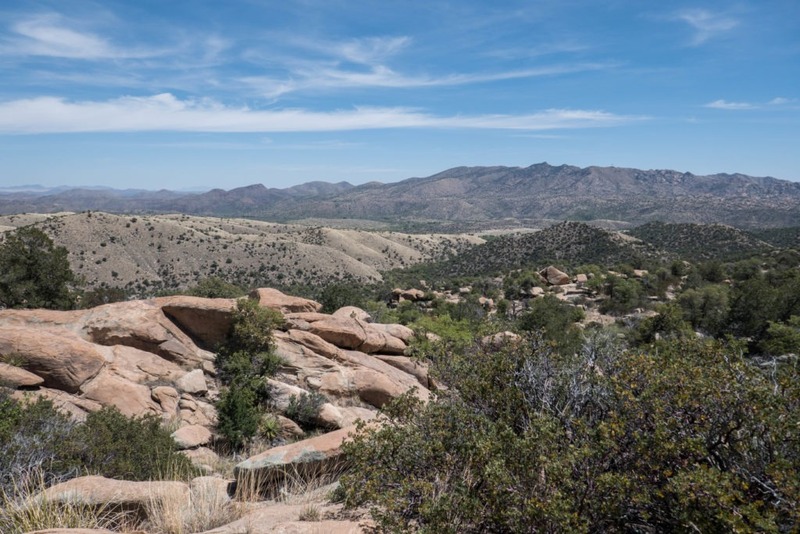 It was used until 1907 when the area was added to Coronado National Forest. 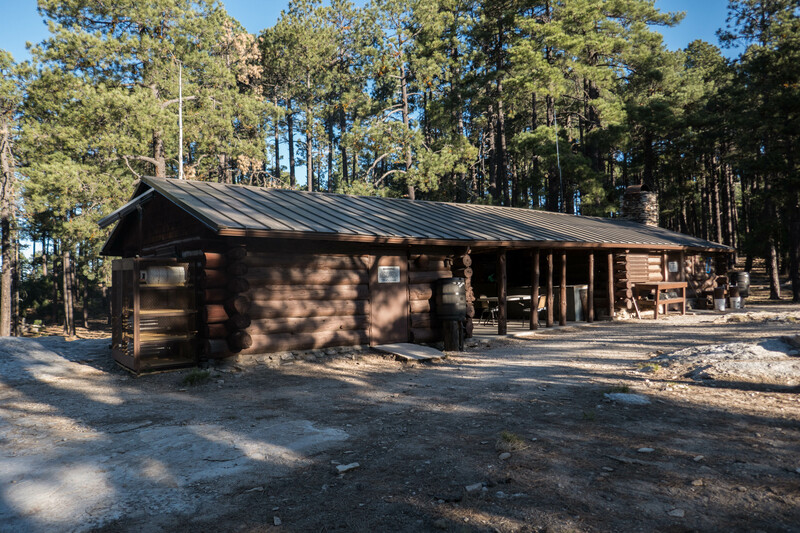 When the national park was established, the cabin and surrounding areas were restored and used as a campground, corral, and research station. Visitors can’t stay in the cabin, but there are six campsites. Doesn’t that sound like a great destination for an adventure? If you’re interested in more information, the NPS has an article about the history at Manning Camp. 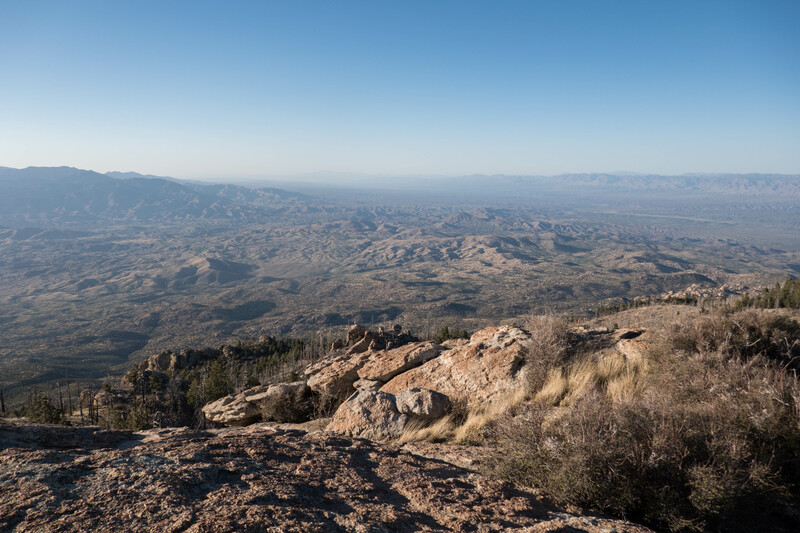 8,000 feet is about as high as you can get from the Sonoran Desert, which has an elevation of around 3,000 feet. 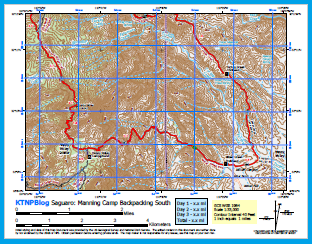 The only way to get to Manning Camp is a backpacking trip, so our plan was set. Mostly. 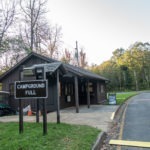 There are six different trailheads to get into the backcountry, and by extension, Manning Camp. The backcountry guide on Saguaro National Park’s website gives a good rundown on the options. There are five designated backcountry campgrounds (dispersed camping is not allowed). Manning Camp which has six campsites; the rest have three. 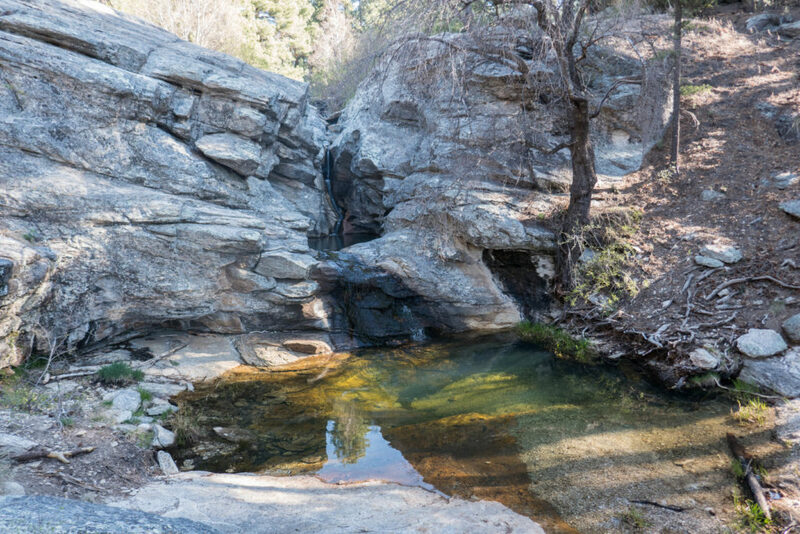 Douglas Spring: Easily accessible on the west side of the Rincon district. Decently close to Manning Camp. But, there are frequent break-ins when cars are left overnight. Tanque Verde: Located on the western side of the Rincon district, inside the park, secure parking. Long distance to Manning Camp, but trail goes through 6 different biomes as you climb from 3,100 to 8,000 feet. 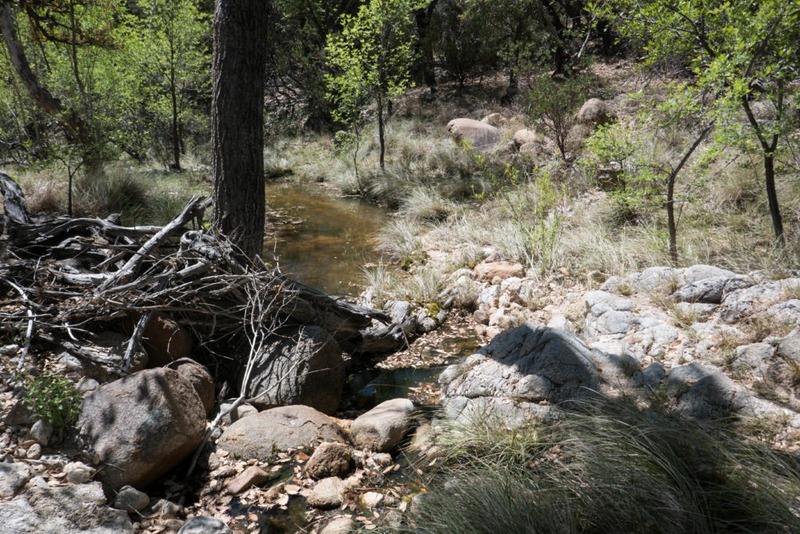 Italian Spring: On the north side of the Rincon district, in Coronado National Forest. 4WD vehicle access only. Loma Alta: On the southern side of the Rincon district. 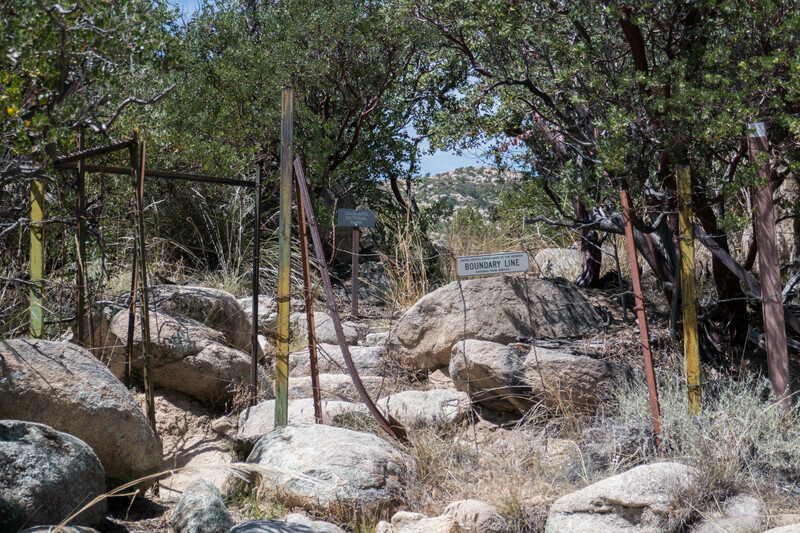 There’s no public access to this trailhead. Miller Creek & Turkey Creek: East side of Rincon District, in Coronado National Forest. You start from higher up (4,200 or 4,250 feet respectively), so not as long to get to Manning Camp. But the trails are steeper, and you have to go through backcountry gravel roads to get there. Turkey Creek follows a 4WD road for a mile or so, so you can get in further if you have the right vehicle. Looking at the list of trailheads, we quickly eliminated Italian Spring from our options since we wouldn’t have a 4 wheel drive vehicle. Likewise, we eliminated Loma Alta since there was no easy way to access it. My initial thought was Douglas Spring, since I had found a route from Backpacker Magazine for that trailhead. But K nixed that idea, because of frequent break-ins that occur there. That left us with Tanque Verde. It is secure, safe, and had campgrounds spaced a good distance apart (you can only camp in designated campgrounds, no dispersed camping). We could do a 3-night out-and-back trip to Manning Camp, staying the first night at Juniper Basin, second at Manning Camp, and back to Juniper Basin for the third night. But when we started planning out our full itinerary for the trip, we realized that we wanted a day to explore the Cactus forest in the northwest corner of the Rincon District. Could we do anything about it? Looking at our map led us to Miller Creek Trailhead which was located on the east side of the Rincons, in Coronado National Forest. We could form a loop with that and Turkey Creek trailhead to manage a two night backpacking trip, giving us that extra day. It would be a bit more strenuous with steeper trails, and the last day would have a decent chunk of mileage. One first night would be at Happy Valley Campground, with our second at Manning Camp. Problem solved. Day 0 – Drive to Benson, stay in the night. Benson is the closest town to the trailhead. Day 1 – Hike to Happy Valley Campground. 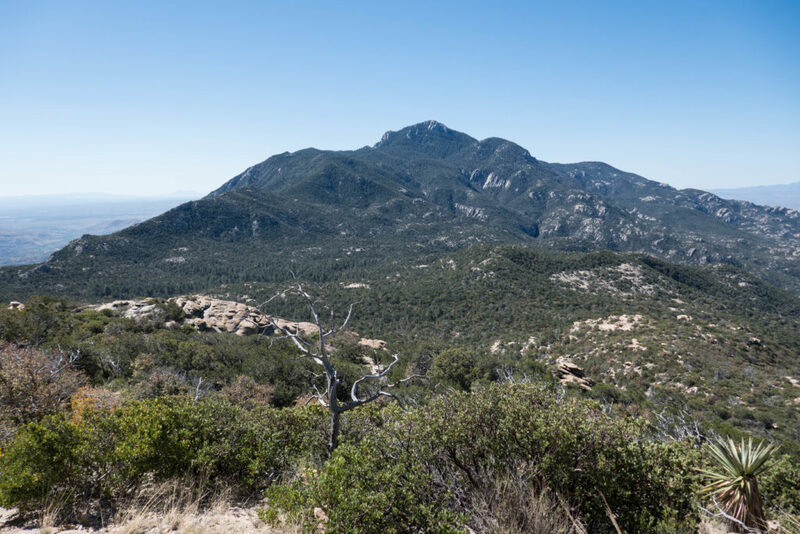 If time allows, hike up 7.2 mile round-trip to Rincon peak from there. Day 2 – Hike from Happy Valley Campground to Manning Camp. 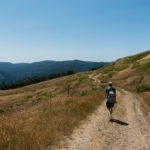 If time allows, hike the 5.0 mile Fire Loop Trail hike. Day 3 – Miller Creek Trailhead via Turkey Creek trail, forming a loop. 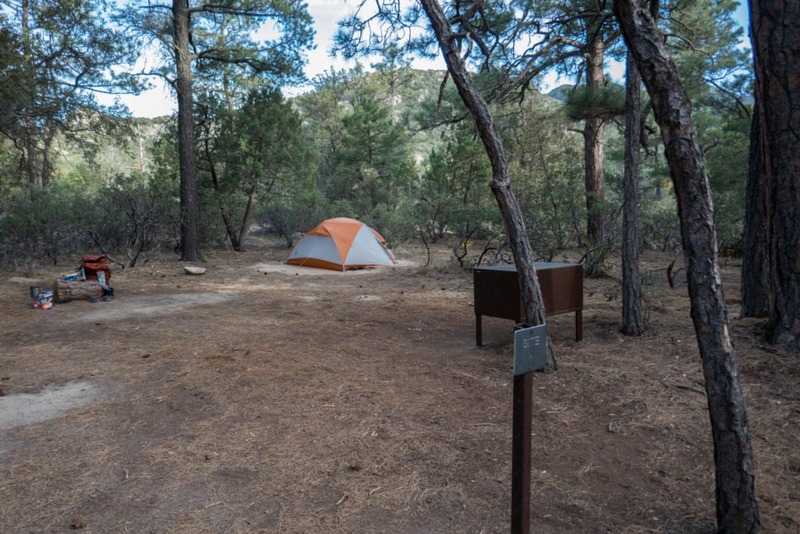 A backcountry permit is required for any overnight stays and it’s $8 per campsite, per night. Permits are issued up to 2 months in advance, but no later than noon on the day of departure. You have to request a permit via mail (see page 7 of wilderness guide), and you’ll receive your permit that way, too. Naturally, we sent our request as soon as we were able. You could also fax or stop in person for a permit. We weren’t too worried about not getting a permit, but you never know if a site will fill up. Additionally, we didn’t know what rental car we’d have, so we left that information blank on the permit, and called the visitor center once we arrived in Tucson. This is the desert, so water sources are hard to come by. 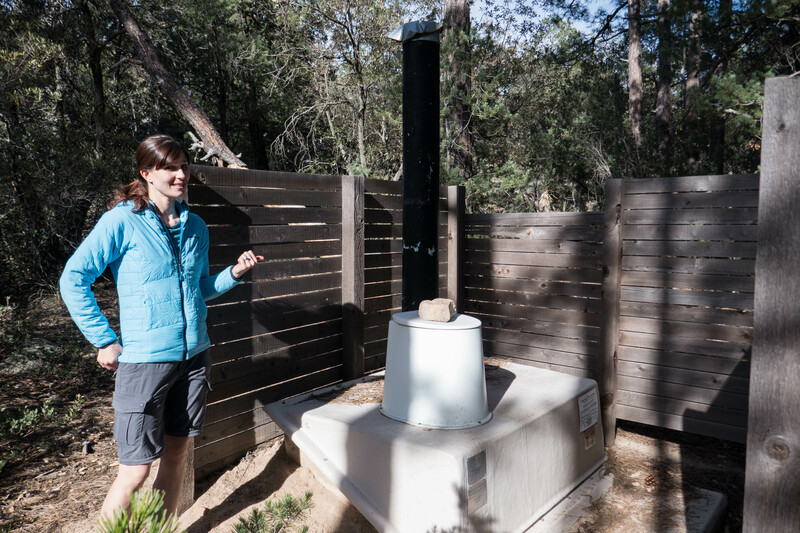 Only some of the campgrounds in the park have springs, and only one of the campgrounds has a guaranteed year-round water source. Thankfully, that year round water source is at Manning Camp, which was the reason the cabin was built there so many years ago. Happy Valley, where we’d stay the first night, did not have a spring – only ephemeral water from snow melt. So water was not guaranteed from our starting point at Miller Creek until we get to Manning Camp. As a result, we each packed 5 liters of water (a 3-liter bladder, and two 1-liter water bottles). This would prove to be enough, as long as we were judicious with our water supply. We wanted to get an early start, especially with much of the trail being exposed to the sun. There was also Rincon Peak, a 6 mile round-trip hike from Happy Valley Campground that we wanted to do after we got to the campground. 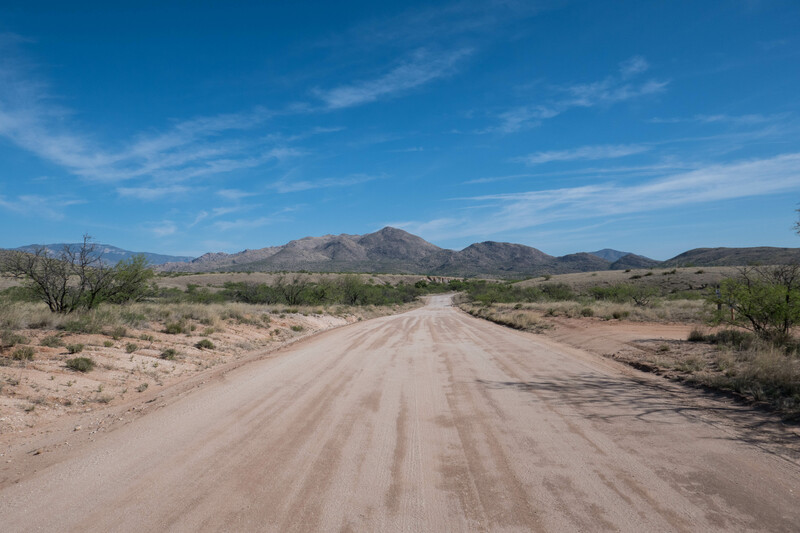 The day before our trip, we were going to be in the Tucson Mountain (west) District, so we decided to drive that evening into a small town called Benson, the closest one to Miller Creek trailhead. According to Google, it would only be a 45-minute drive to the trailhead from the Comfort Inn in Benson. … and the restaurant was actually quite good, though we came in with low expectations. 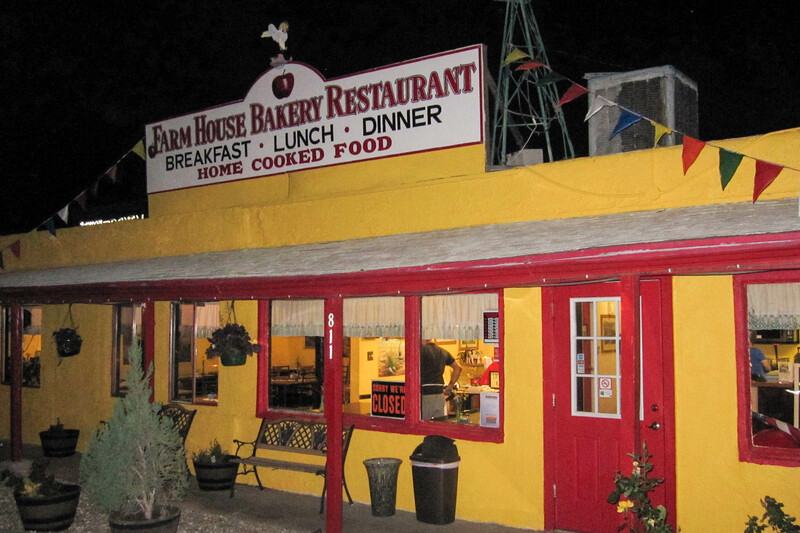 Super casual atmosphere, quirky country decor, friendly staff, and solid American/country-style food. 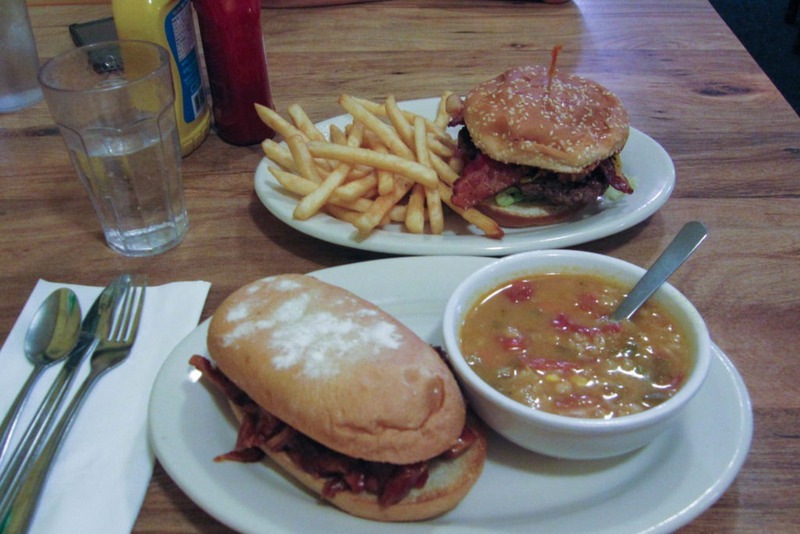 K got a pulled pork sandwich with barley vegetable soup. The sandwich was sweet, with lots of BBQ sauce (which K loves), while the soup was basic but homey. I got an Avocado Bacon Burger, which I enjoyed, though it had no avocado (and was too tired to ask for some). K kept stealing my fries, which were simple, but good. While we ate, we listened to older country music which K is a fan of. We closed down the restaurant, and barely made it out before they shut down for the night. A filling meal before our hike, and certainly better than McDonald’s. And so our adventure began. We ate a quick breakfast, checked out of the Comfort Inn, and started the drive to our trailhead on North Mescal Road. 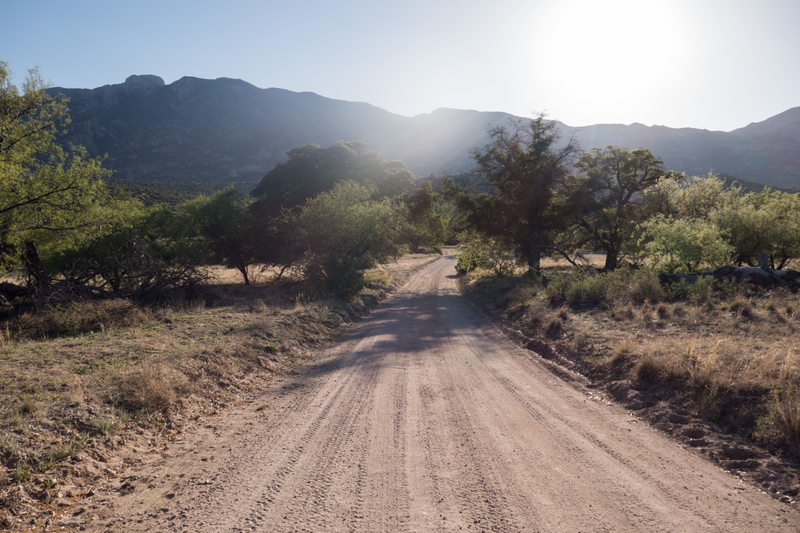 Before we knew it, we were onto Forest Road 35 (Happy Valley Road), a dirt road going through the Coronado National Forest. With gorgeous views of the Rincons in front of us! We stopped a couple times just to take pictures, and admire our surroundings. The road wasn’t in bad condition, it was nicely graveled and decently level. 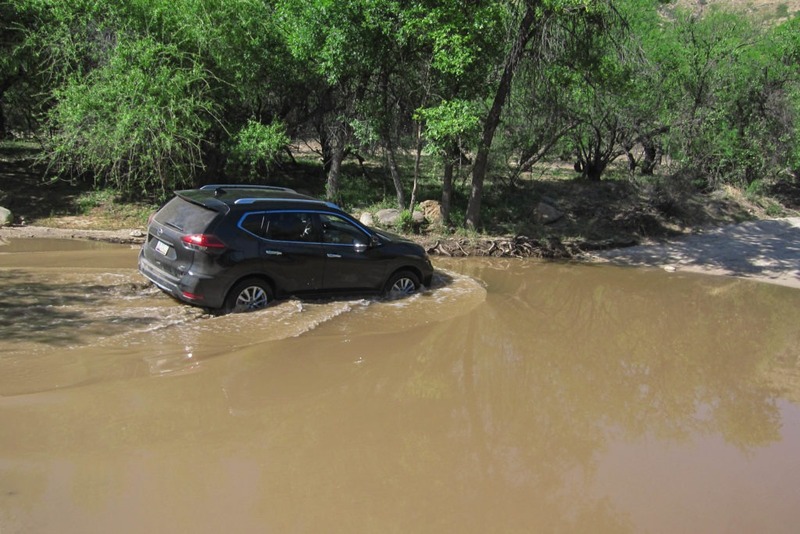 Our rental car was a Nissan Rogue – no 4 wheel drive, but it had a higher clearance. It handled the road without issue. We continued on, winding up and down the mountains, the views from the road continuing to impress. 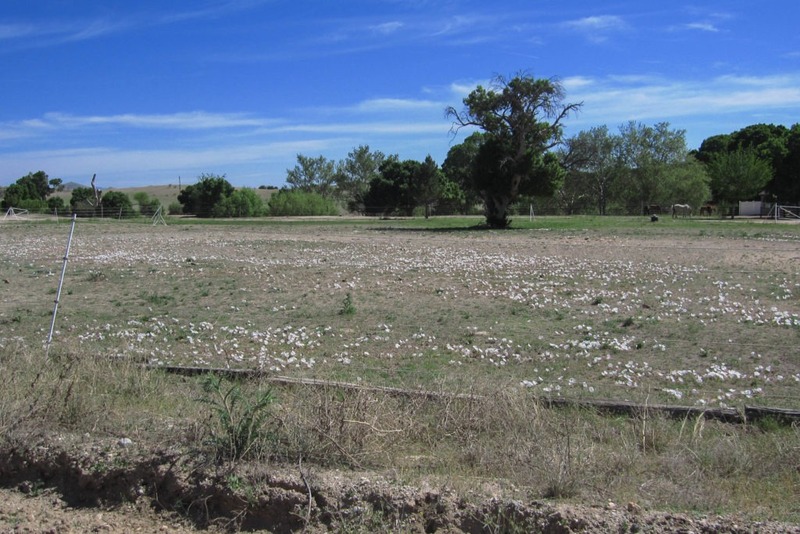 There were no saguaros in sight; this was more of a desert grassland environment. We also passed a few ranches and small houses on the way. Everything was going great, beautiful day, making good time. 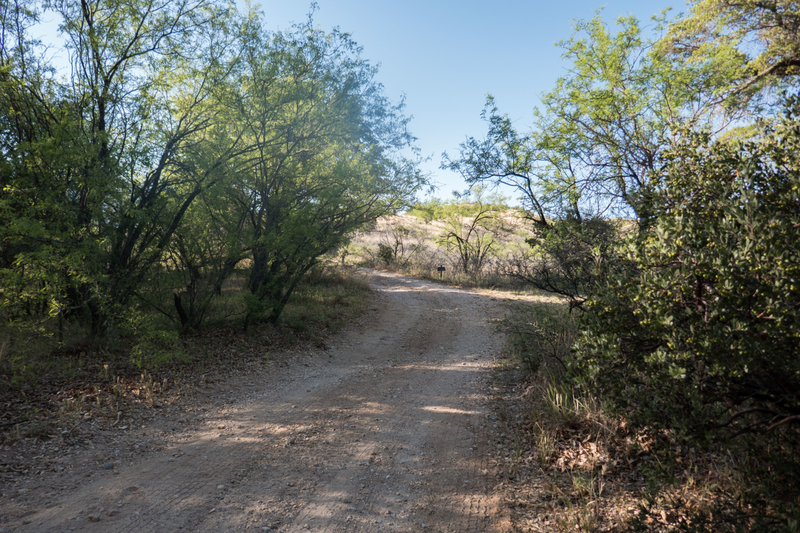 And, of course, that’s when we ran into a large muddy stream running across the dirt road…the adventure had started well before we got to the trailhead. The water flow across the road on the way to Miller Creek…doesn’t seem so bad looking at it now. None of our research had indicated a stream across the road, so it was certainly a surprise. We stopped the car, got out, and walked to the water’s edge. We grabbed a rock, threw it in, and it made a big splash. That wasn’t very helpful for figuring out how deep it was. I grabbed my trekking pole, and stuck that in. It was about 10 inches deep, but this was only on the edge. Could we make it across? We’d never driven across something like that. But we weren’t going to give up. Hearing voices past the water, we set out to investigate. We walked on the side of the road, and jumped across a narrow part of the stream. We were across! But without our car or gear, and miles still away from the trailhead. Following the voices, we walked along the road for a few minutes until we saw a couple camped on the side of the road. After chatting with them, we learned they’d crossed with a small, lower-clearance sedan. They also told us a spring was the culprit, and that the left side of the stream was shallower. Newly emboldened, we went back to the car, and I got in. K was still a bit apprehensive that we’d flood the engine or something, so she waited outside. I started the car, and eased slowly across the stream, making sure to stay on the left side. We made it! As we drove past the other couple camping, we made sure to thank them. On the drive back after backpacking, the water remained, but had decreased in volume. Further up the road there were puddles, but nothing as big as the stream we had crossed. We passed many washes, and that was typically where we saw water. 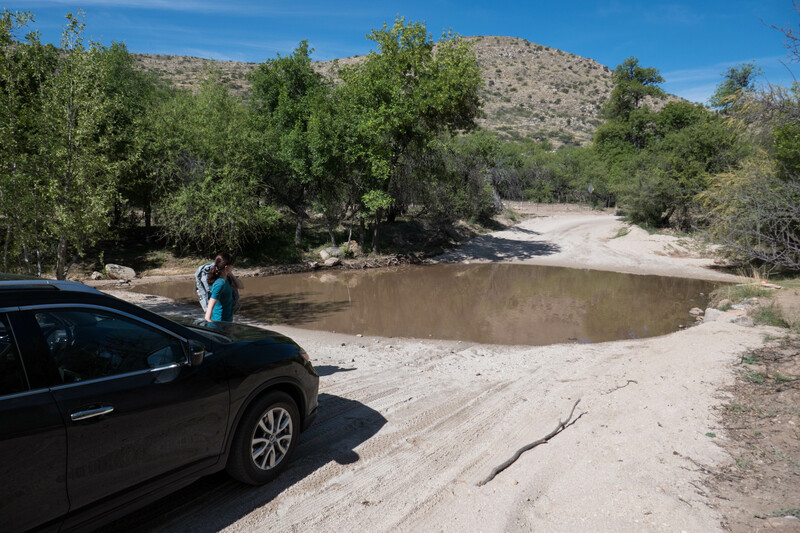 At certain times of the year, when the wash was running, this road would be impassable without a high-clearance vehicle. As we drove on, we started seeing a few potholes, which we did our best to avoid. Happy Valley Road also became sandier and bumpier as we passed ranches and pastures, and continued to enjoy mountain views. And before we knew it, we arrived at Miller Creek. We went for it. Don’t tell our rental company. An unfamiliar sight: lots of trees! There were a few ranches near Miller Creek. The small white blobs are flowers. Arriving at the trailhead, we were the only ones there. We did our best to park in some shade, loaded on our packs, and set off for Happy Valley Campground. 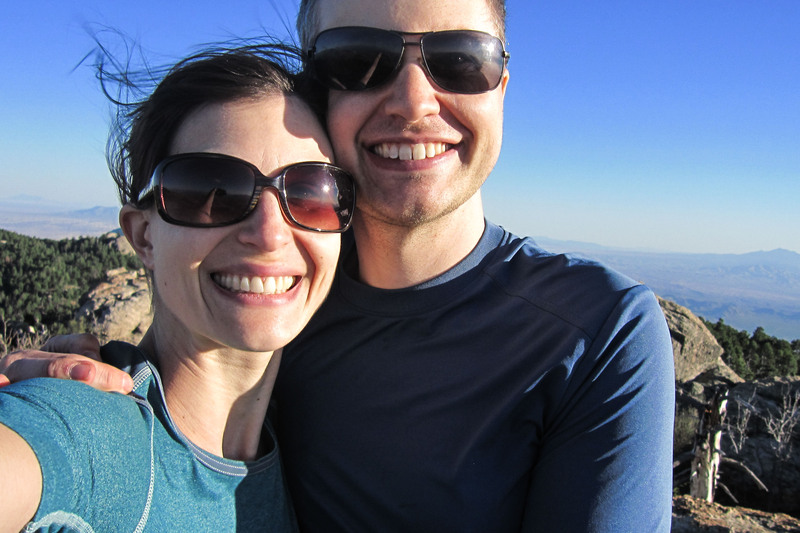 If we had time, we planned to do an additional hike up to Rincon Peak. 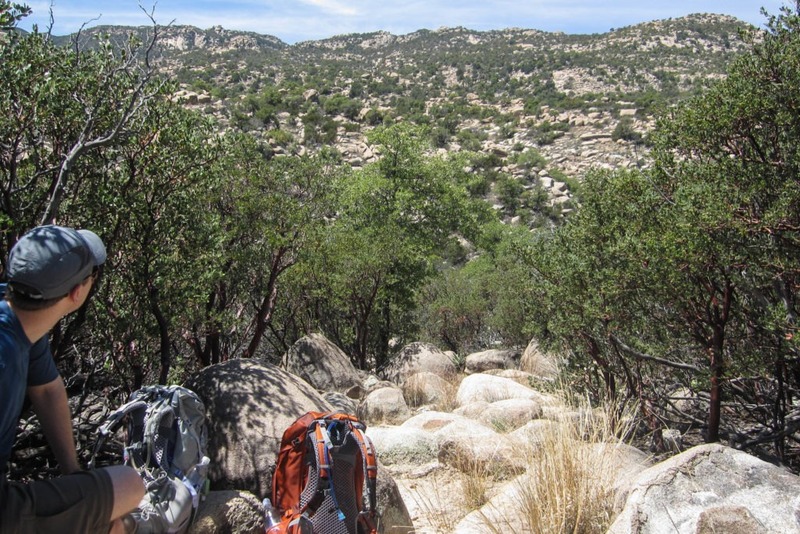 In each of our packs was 5 liters of water: a 3-liter hydration bladder and two 1-liter water bottles. This had to last until we got to Manning Camp, since that was our only guaranteed water source. Every other campground, except for Happy Valley and Juniper Basin, has a seasonal spring. Happy Valley only has water from ephemeral streams due to snow melt, but we weren’t counting on that. 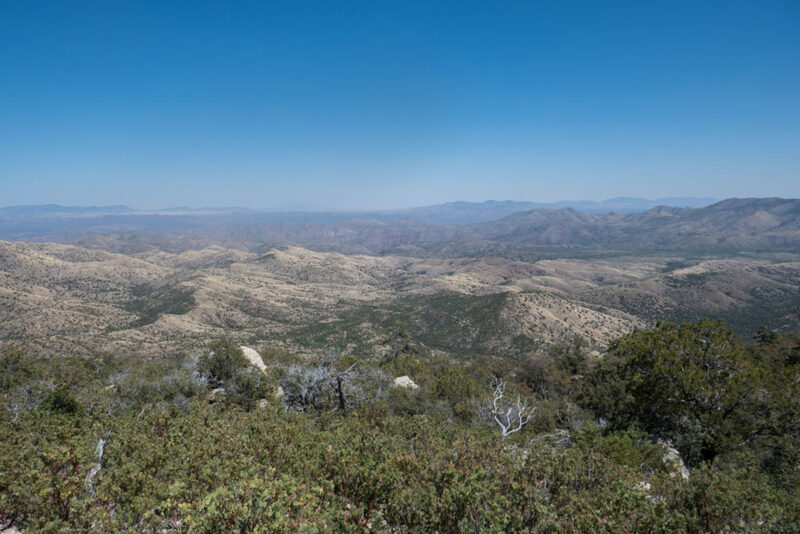 We were still on Coronado National Forest land – it would be 1.3 miles until we reached the Saguaro National Park boundary. Until that point, we would hike through grazing areas and meet lots of friendly cows. And watching our step because of those friendly cows. As we started the hike, there was a cow right on the trail. As we approached, she mooed, got up, and walked away. Amused, we passed by. The trail was sandy, with shiny mica bits. It makes sense, as Mica Mountain, the tallest point in the park, is at the top of the Rincon Mountains. 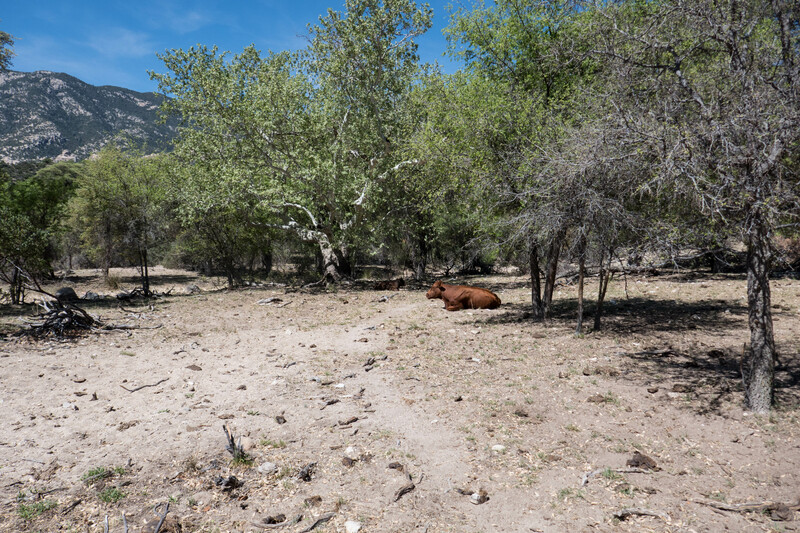 We kept our heads down as we walked to see the mica, and avoid the cow pies. The Miller Creek Trailhead sign, only 1.5 miles to Saguaro National Park! Though it’s only 1.3 miles according to my maps. Same with Happy Valley Campground, it’s actually 4.1 miles. The campground was moved at one point, so maybe this sign is out-of-date. The trail was pretty easy going at this point, with a few trees which offered a nice respite from the shade. Before long we started seeing pools of water, and finally a small creek (the titular Miller Creek). This is what made the area a bit greener than we expected. But we continued to slowly ascend, and we started returning to the desert grassland. 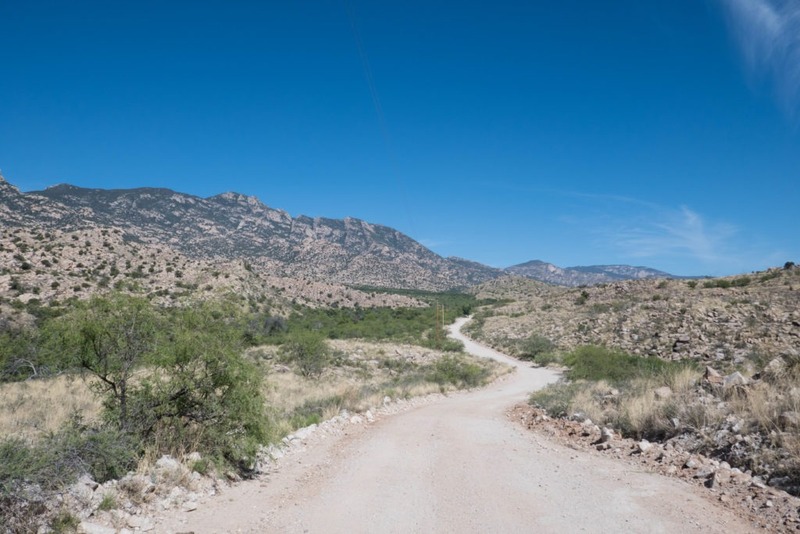 Ahead, we could see our path through the beautiful Rincon mountains. 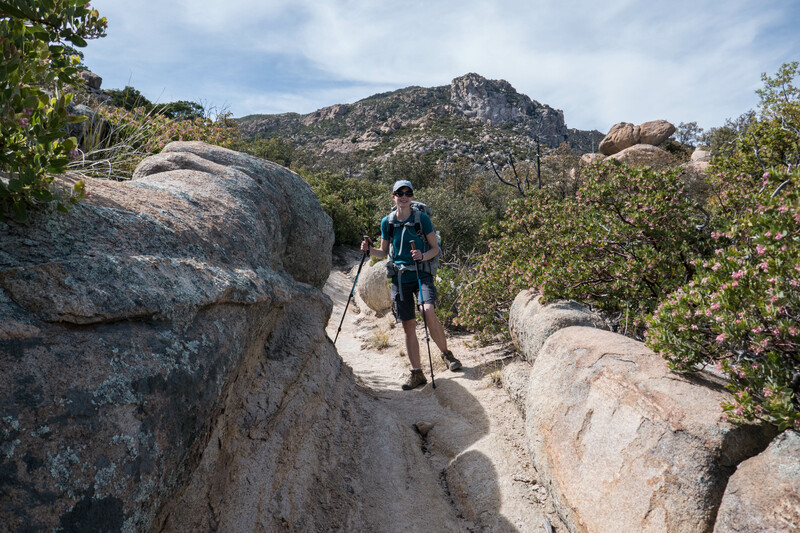 The trail became more open and rocky as we approached our first checkpoint: the national park boundary. We entered the park through a gate, which keeps cows out, and took a quick celebratory break. It was great to get our packs off our shoulders, even for a few minutes. We looked around, and noticed an interesting tree on either side of the trail. The bark was deep purplish brown that twirled together with a grey bark, almost resembling a candy cane. 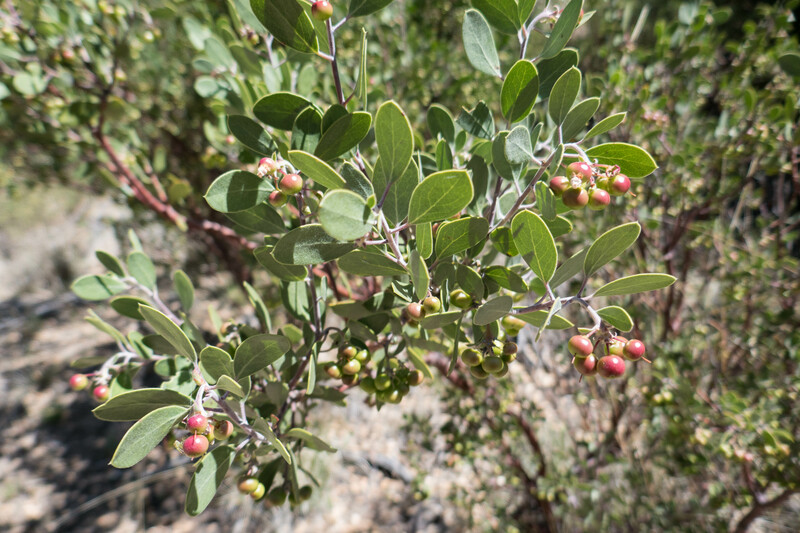 I researched it after our trip, and found that it was a Manzanita tree, which means little apple in Spanish. Looking back at the photos, this made sense because of its small round fruit. 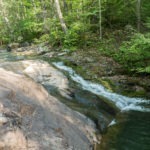 Miller Creek – the water looked a bit murky, but it’s there if you need it. Make sure you filter it; the cows have access too. We’ve reached Saguaro National Park! Again, there’s a fence to keep cattle out. A Manzanita tree on Miller Creek Trail. As we ascended, the trees still had flowers due to the cooler temps. It’s either a Pringle Manzanita (Arctostaphylos pringlei) or Pointleaf Manzanita (Arctostaphylos pungens). After a brief rest, we shouldered our packs and headed on. This part of the trail was the strenuous incline we were expecting. It was around 1,900 feet overall elevation gain over only 2.8 miles to get to Happy Valley Campground. 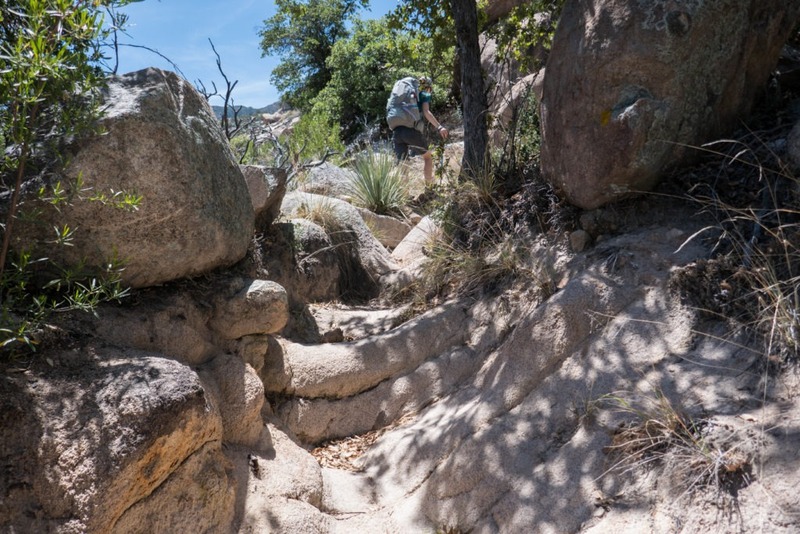 Additionally, the trail was rocky, sandy, eroded, and required a bit of scrambling here and there. Naturally, it was a ton of fun! And also grueling and exhausting. Markings on the trail are not a strength – it’s not blazed. Occasionally we’d lose track of the trail. If this happened, we learned that we could follow the sand and use our intuition to pick it back up. Occasional small cairns helped guide us, but these were few and far between. 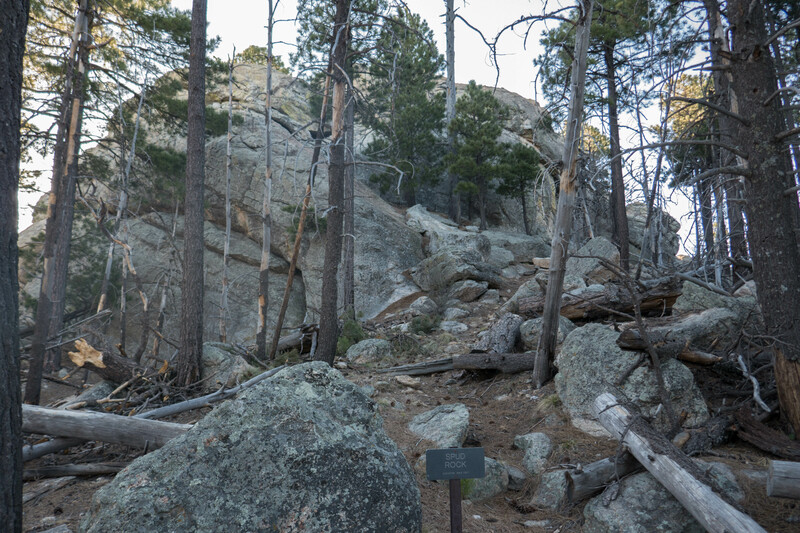 Rocks and branches were placed across areas that marked where hikers should NOT go. 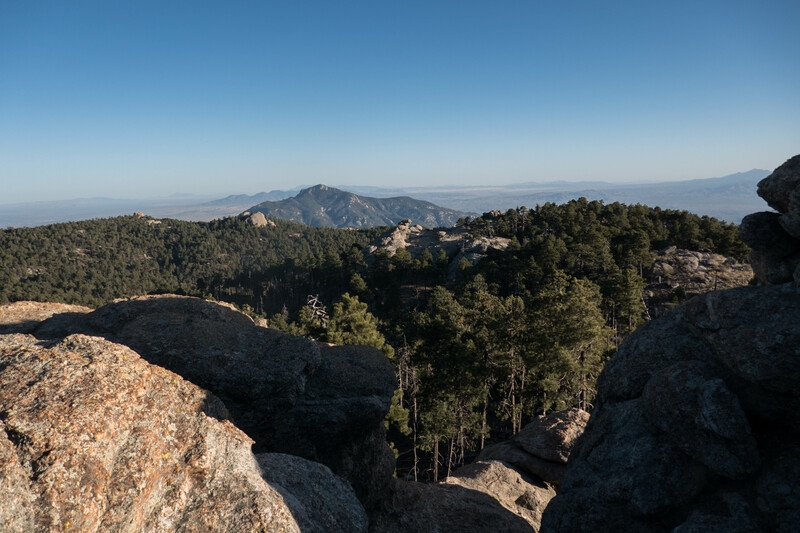 The views as we ascended were spectacular, and they were enhanced by the huge boulders and rocky terrain. 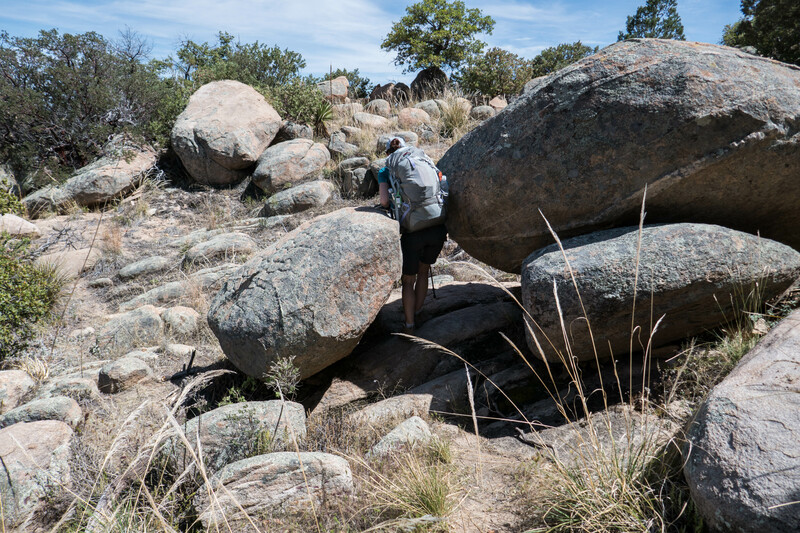 Some sections with large boulders reminded me a bit of Joshua Tree National Park. Occasionally, we looked out at the view and tried to pick out our path in the valley below. I kept a lookout for wildlife, but we only saw lizards and birds. Mountain lions are rare in the area, and sadly, we didn’t see any. 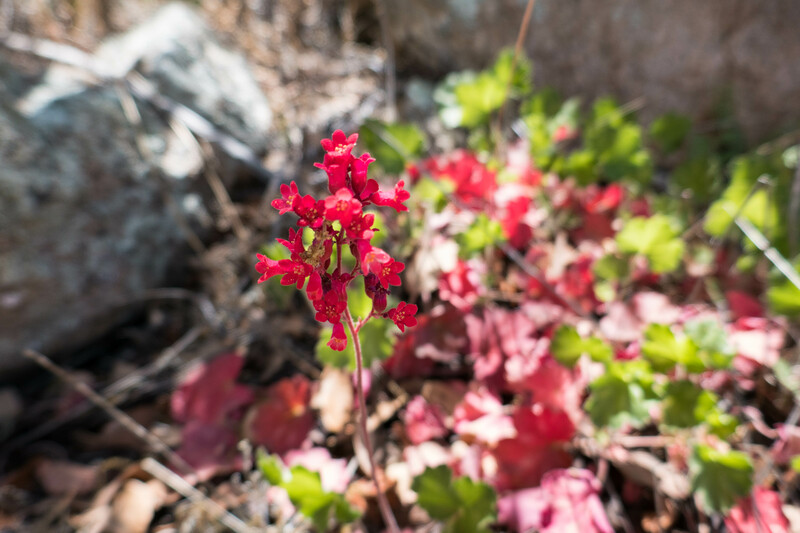 These pretty red flowers are Coral Bells (Heuchera sanguinea). They’re also called Alumroot, and you’ll sometimes see a cultivated variety in gardens. Sure, we could have gone around, but it wouldn’t have been as much fun! Our trip up was so sunny and hot that we stopped for breaks whenever we had a bit of shade. Our only complaint with the shade was having to share it with small, annoying bugs. But shade is at a premium, so you don’t really have a choice! The trail wasn’t quite what we expected. A variety of boulders made for gorgeous scenery and interesting terrain. 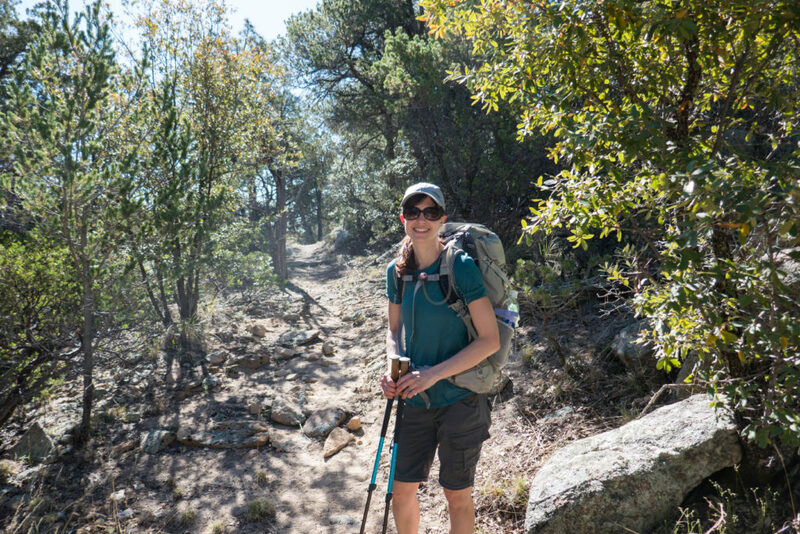 We both had trekking poles, which we recommend, as there was loose rock and sand on top of boulders, which made for sometimes unsure footing. We tried to ration our water, but also made sure we were hydrated. We hadn’t seen any water since we passed Miller Creek at the start of the trail. We planned to hike to Rincon Peak after arriving at Happy Valley Campground, and wanted to ensure we had enough water for the trip. As we ascended, the desert grassland gave way to oak woodland. The trail became more forested, we kept assuming we were almost there. But we weren’t – it was taking far longer than expected. The long car ride, along with the heat and incline, made our side trip to Rincon Peak unlikely. We kept trudging along. 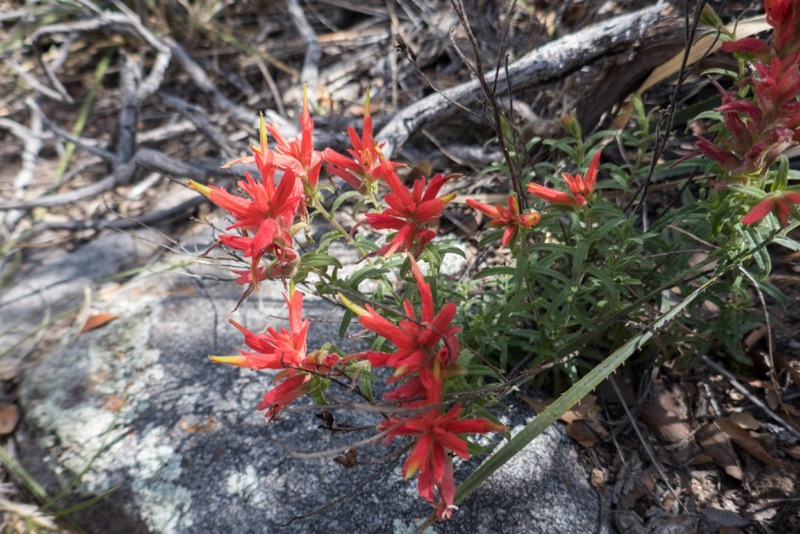 This is Santa Catalina Indian Paintbrush (Castilleja tenuiflora). We saw a few of these on the way up on Miller Creek, as well as some other varieties of Indian Paintbrush higher in the Rincons. Doesn’t this look exciting? There was a lot of scrambling along Miller Creek trail. 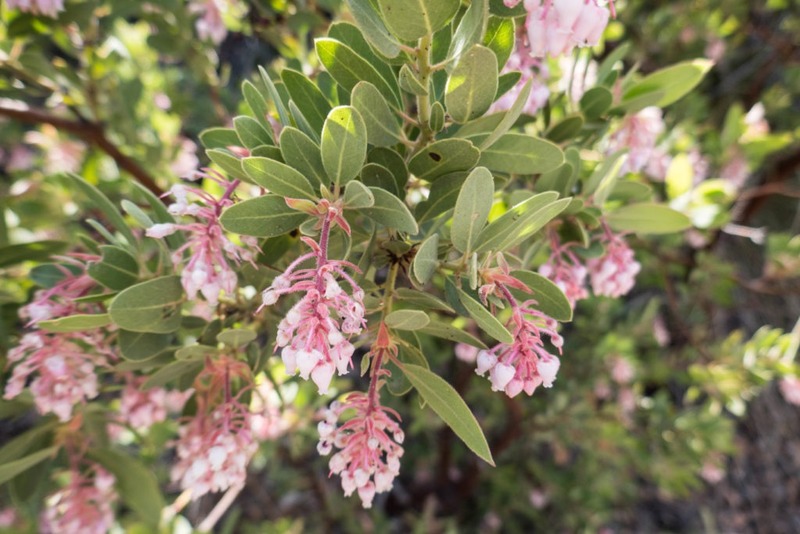 The beautiful pink flowers of manzanita at higher elevation along Miller Creek Trail. 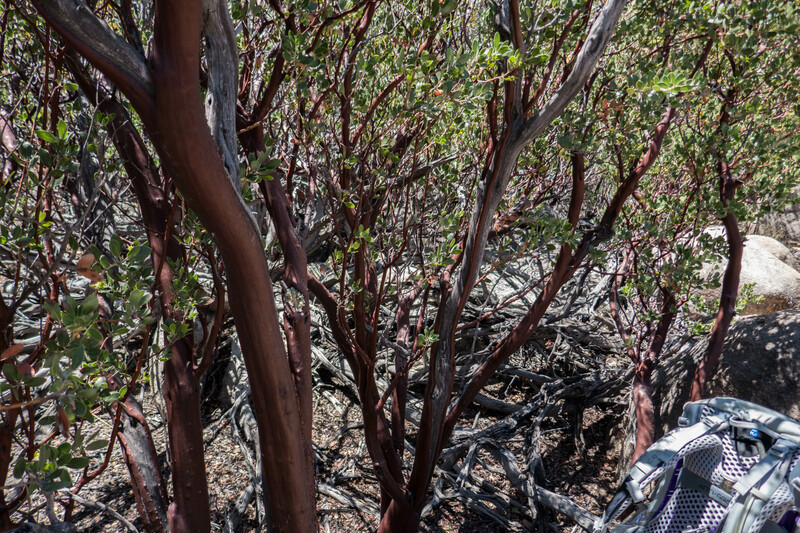 Compare it to the lower elevation manzanita which had fruit on it. Bees were buzzing all around them. There were some interesting rock formations on the trail. This one looked like a half pipe (use your imagination)! You can also see flowering manzanita on the right side. We made it into a wooded area along Miller Creek Trail, near the intersection with Heartbreak Ridge Trail. We had to climb over one tree, and under another. When we saw a sign marking an intersection with Heartbreak Ridge Trail, we were overjoyed. We were almost there! We turned left at the intersection, and it was a short 0.2 miles to the campground, which appeared on our left. At this point, we had also started seeing pine trees, which made sense, since we were at an elevation of around 6,200 feet! Pine cones littered the forest floor, and yellow wildflowers added pops of color. 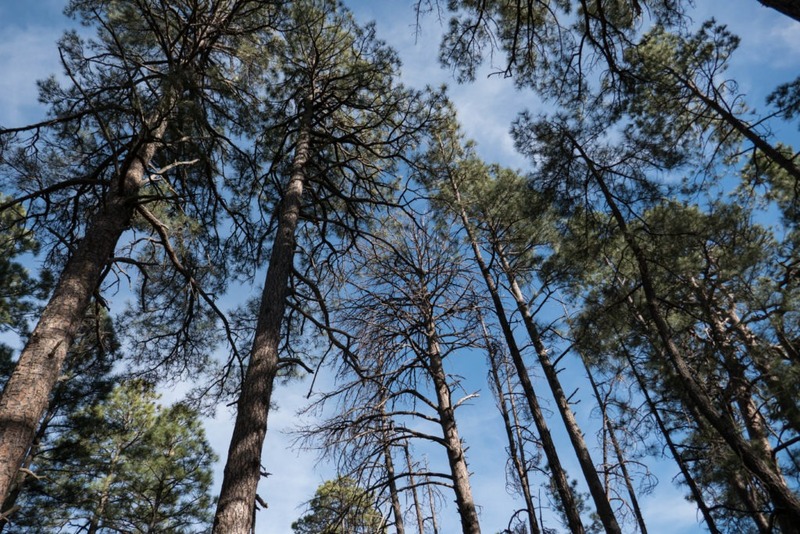 Pine trees towered over us as we made our way into the campground. It was very majestic and peaceful, located in a tree grove. We had seen no one on the trail, though we figured we would in the campground. But we had it all to ourselves. K went to find the pit toilet while I explored the campsites. After wandering around, K pointed out what seemed to be a critical flaw in the bathroom – it was only three-sided, without a roof. We were both amused and confused. Would it have been that costly to put up a fourth wall with a door? Arriving late in the campground meant we had to forgo climbing Rincon Peak. Add it to the list for next time. We wanted to go, but realized we didn’t have enough water or time. 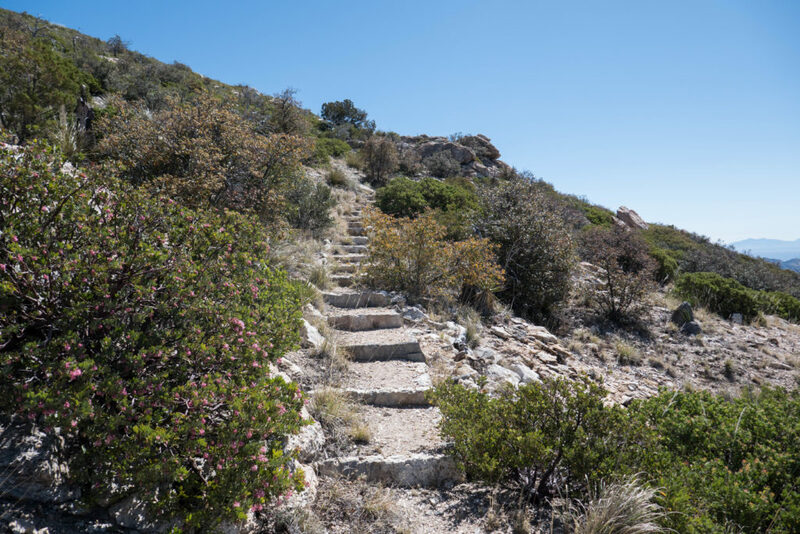 If you want to hike Rincon Peak, we recommend you stay a second night at Happy Valley, and do Rincon Peak as a dayhike. You would need an additional day’s supply of water, though. The peak would be visible on our hike tomorrow, taunting us that we didn’t get to climb it. Happy Valley has three campsites. We chose campsite #1, pitched our tent, and took some time to relax and make dinner. We didn’t look around for water, assuming there was none since we had read nothing about a spring here, only ephemeral streams from snow. There had been snow 2-3 weeks ago, but now, there was nothing. Since we had the place to ourselves, we were able to explore the other campsites. 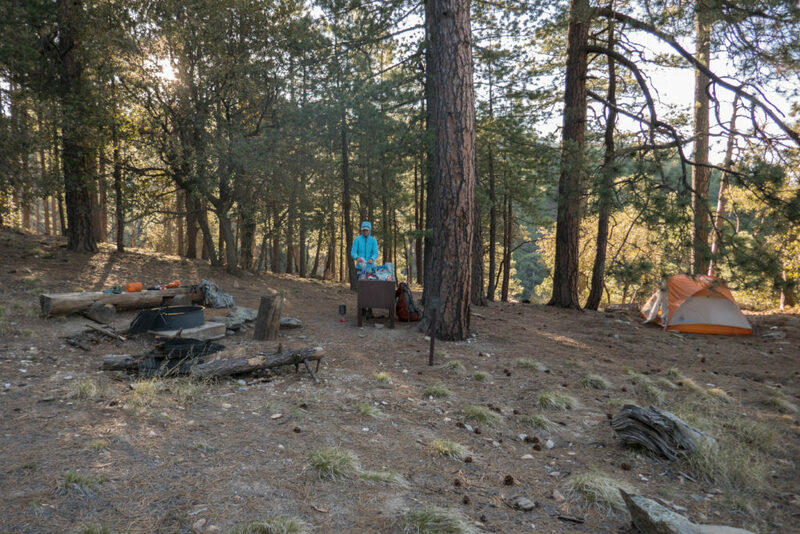 We found campsite #3 to be the best, as it was the furthest removed from the trail, had log chairs, a leftover portable table, bear box, and fire ring. We would have stayed there had we found it sooner. Campsite #2 seemed to be the least desirable, mainly because it didn’t seem to have a bear box. 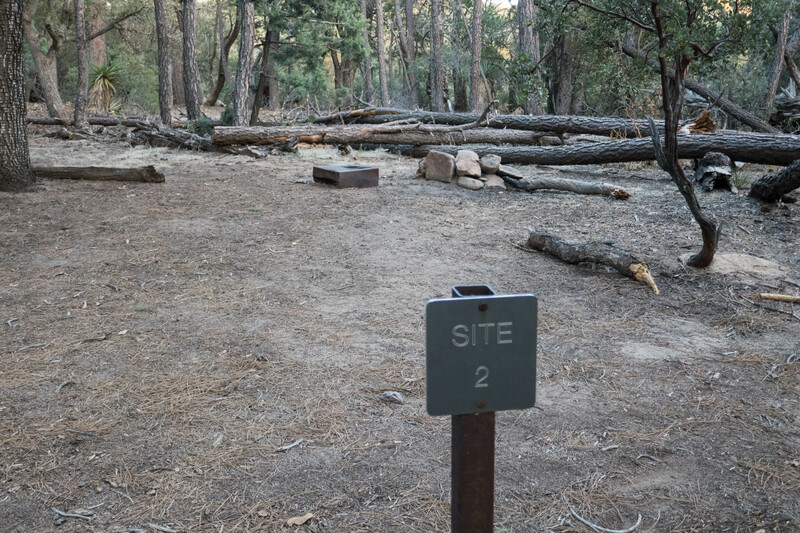 Our site, #1, had a fire ring, bear box, and log seats, but if anyone came to the campground they’d go through our site (of course, no one did). It was getting cool, quite different than our time in the desert scrub portion of the park, which was at 3,000′ feet of elevation. We were glad to have our jackets! 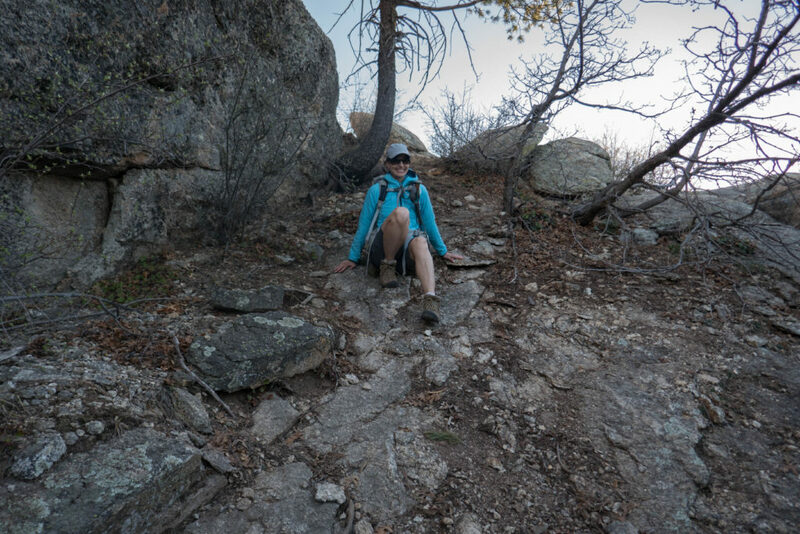 This had been a hard day, the hike was difficult with the weight of our packs, heat, and the elevation gain of the trail (around 2200′ over 4.1 miles). Exhausted, we went to sleep so we could get an early start for the long day tomorrow. 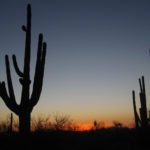 We woke up refreshed at Happy Valley Campground in Saguaro National Park. And a little cold. But happy. Something about it all just makes your body and soul feel good. You get to relax, enjoy the views, nature, and get away from crowds and work. We were at 6,000 feet of elevation. The sun slowly peeked in, but the pine trees were blocking our precious sunshine. Finding what sunshine we could, we sat there eating our oatmeal. Slightly sad, we packed up and said goodbye to our campground. We wanted to get to Manning Camp at a decent time so we could do additional hikes around it. So we wasted no time, leaving at 8:30am (this is early for us). We hoped it would turn out better than our attempt to climb Rincon Peak. It would be 6.4 miles and 2,764 feet of elevation gain to Manning Camp. Walking out of the campground, we turned right to go back to the intersection of Heartbreak Ridge trail with Miller Creek Trail. This time, we would head straight on Heartbreak Ridge. 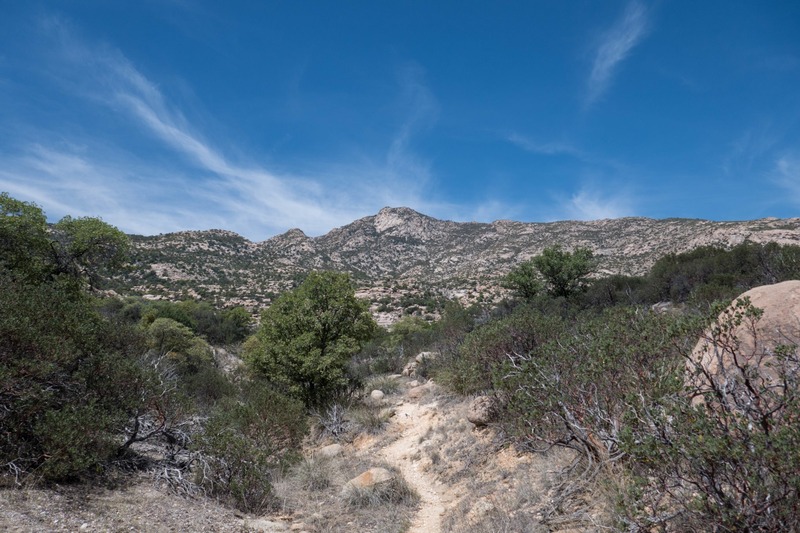 The trail started out in Happy Valley Saddle, which is the region between Rincon Peak and Mica Mountain. We’d have a similar elevation gain to the previous day, but it was more gradual this time with ups and downs, so we hoped it would be slightly easier. As we moved into the saddle, the pine trees vanished, and we were back in a desert grassland. Flowering manzanita lined the sides of the trail as we ascended. Why is the trail called Heartbreak Ridge? Seems ominous. I’m assuming it’s because when you think you’re almost there, you realize you have more to go. Happy Valley Lookout was the first intersection we encountered. I wanted to check out the lookout on the side trail, but we decided to keep going in the interest of time. We could see Rincon Peak the whole way up to Manning Camp too. And it taunted us every step of the way since we didn’t get there the previous day. Like day 1, we relied on periodic shade that allowed us take breaks, and grab water or a snack to recharge. Sunglasses are essential on this trail, which is mostly exposed to the sun. 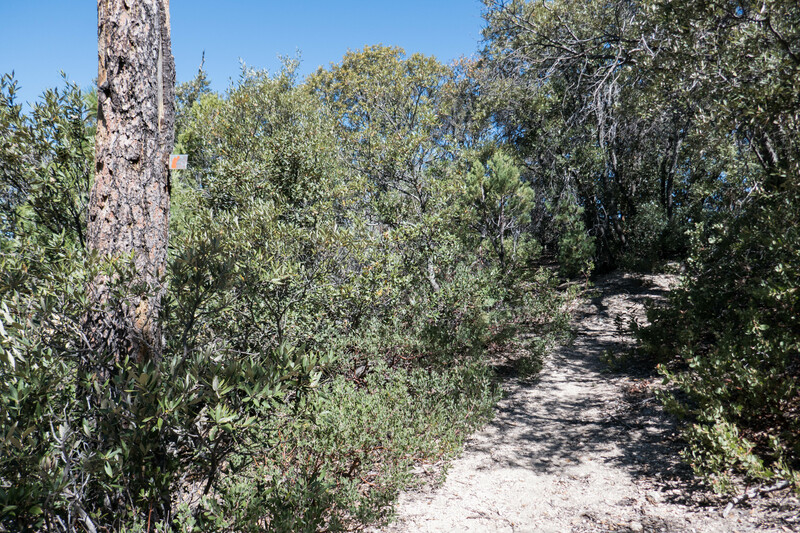 The trail was not well-maintained; there were multiple downed trees, bushes on the trail, and eroded slopes. Sometimes the trail was marked with reddish metal flags embedded in trees. Who knows how long they’ve been there, but they were still helpful. Again, the trail is speckled with bits of mica that reflect sunlight. Notice the small red trail marker with peeling paint hammered into the tree on the left? They’re around, but few and far between. Our weary bodies kept going, and we passed Deerhead Spring Trail on the right. For now, we continued on Heartbreak Ridge Trail. The Deerhead Spring Trail sign said it would be only 0.5 miles until we got to Four Corners. Four Corners wasn’t on any map we had, but based on the mileage and looking at the map, we assumed it was the intersection of Heartbreak Ridge and Devil’s Bathtub trails. We soon reached the intersection with Devil’s Bathtub Trail, and turned left. And gloriously the trail was more level than Heartbreak Ridge, which was a relief. A little bit into the trail, we reached a sign that pointed us to Devil’s Bathtub, located at 7,500 feet of elevation. And we saw our first sign of water in a day and a half. 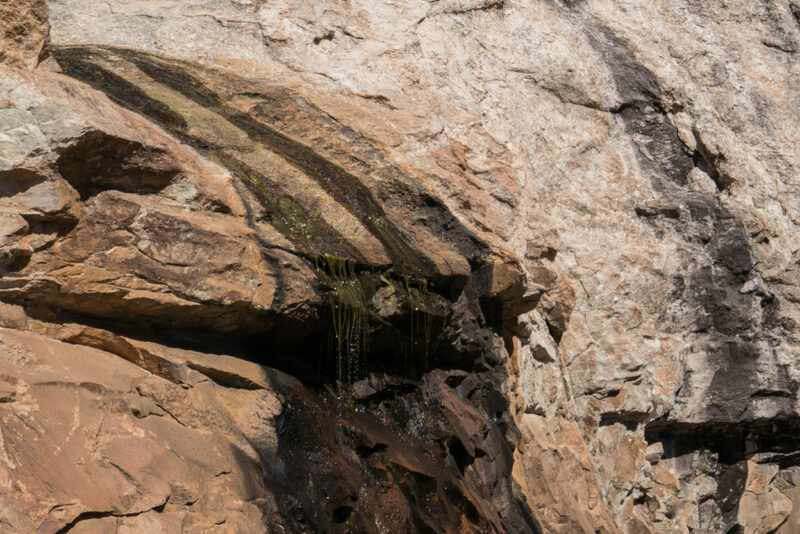 A small trickle of water flowed across rocks, until it came to the edge of a rock cliff where it dripped down and down and down, until it hit a large pool of water. You can’t miss it, but there’s a wooden sign just in case. There was no easy way to reach the large pool of water, hence the name. And we couldn’t get anything from the small trickle on top either, not easily at least. So we enjoyed the view, walked around, took photos, and were just glad to see water. At this point we were also very much in a pine forest, similar to Happy Valley, which was nice since we weren’t as exposed to the sun. We didn’t expect the environment to change so rapidly. The flow of water going into Devil’s Bathtub. Well, more like flow of drips. First water we had seen in awhile and yet…there’s no easy way to get to it. 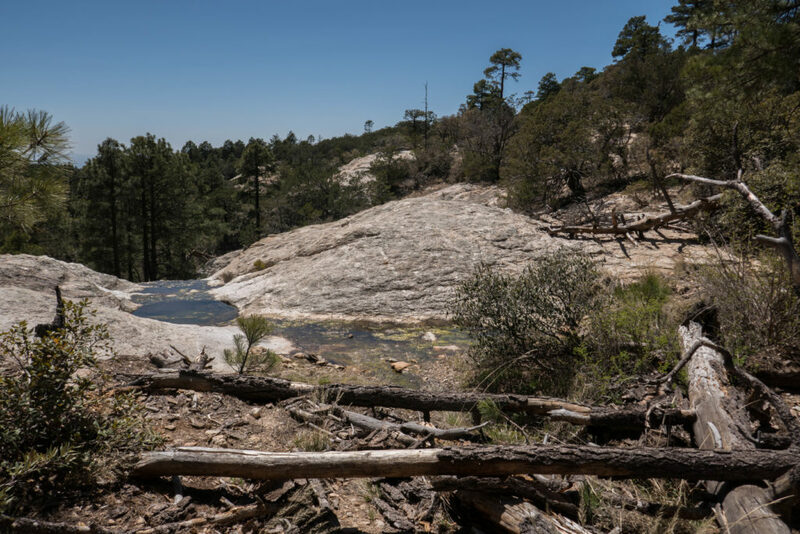 Soon Devil’s Bathtub trail dumped us out on Manning Camp trail, which is part of the Arizona Trail, an 800-mile National Scenic Trail from Mexico to Utah across the state of Arizona. 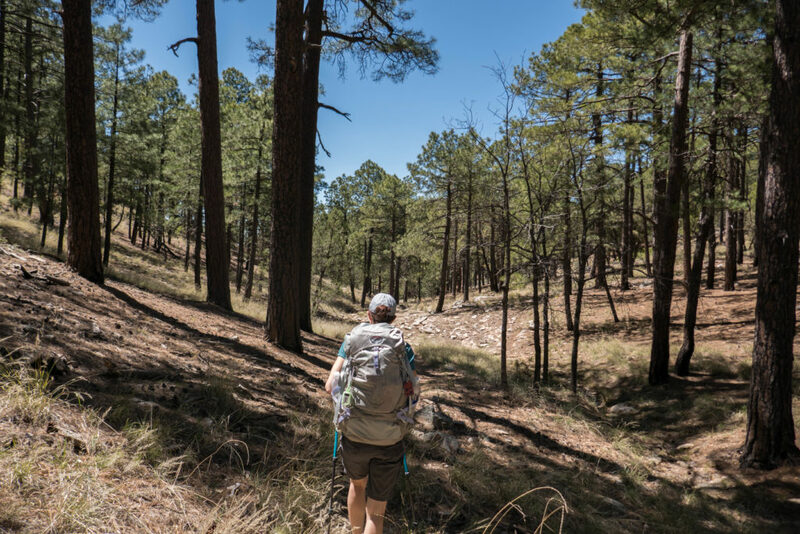 We’d only be on the trail for 1 mile until we reached the campground, but the Arizona Trail bisects the entire Rincon District. With renewed spirits (and some energy chews), we headed north. Along the way, I saw a lizard scamper near the trail. Now, we had seen plenty of lizards on the trip, but this one looked different. It had horns. 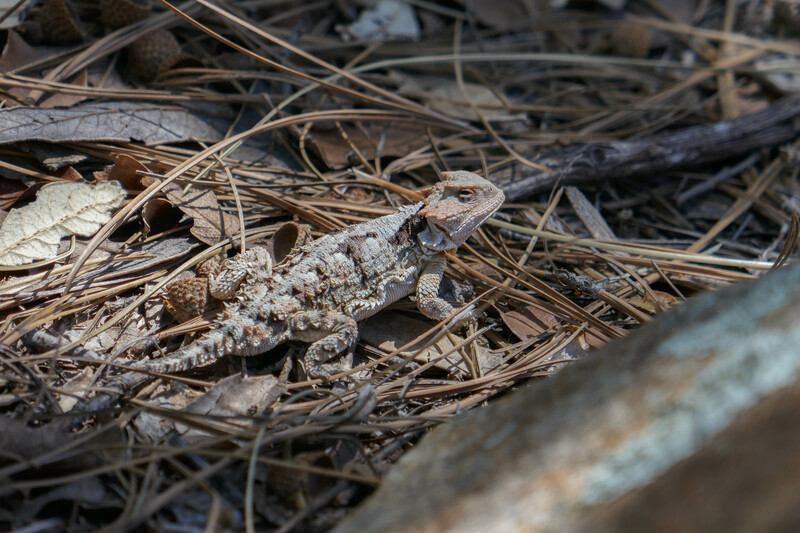 Initially I thought it was a Regal Horned Lizard (Phrynosoma solare), but research after our trip told us it was a greater short-horned lizard (Phrynosoma hernandesi). It was small, only about five inches in length, but was very interesting to look at with all the horns, knobs, and scales. We waved goodbye, and were soon greeted with the sounds of a stream. Shortly, we saw the small creek gurgling below to the left of the trail. We could have filtered water from the stream, but we were close to Manning Camp at this point. And a few hundred feet later, the small stream crossed the trail for easier access if we needed it. We jumped over it and headed up. Wholeleaf Indian Paintbrush (Castilleja integra) on Devil’s Bathtub Trail. This one blooms spring through summer. 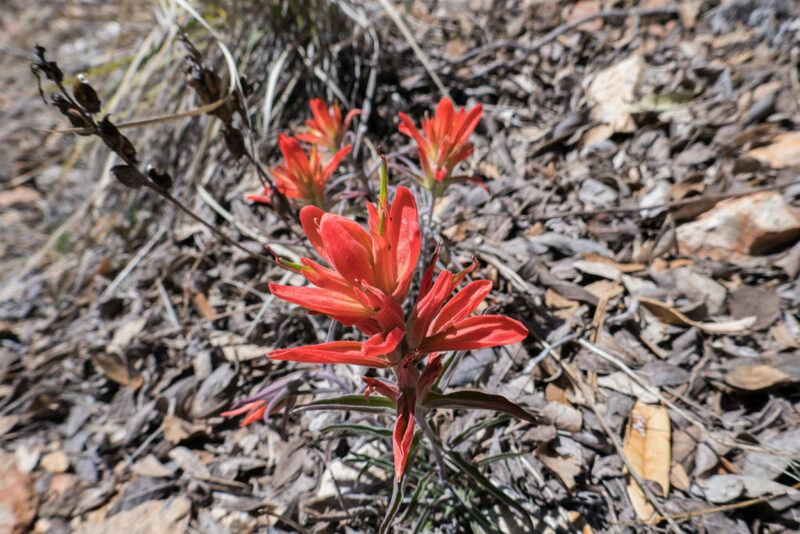 We saw other varieties of Indian Paintbrush on the trail too. And soon we saw it, on our right – campsites. We’d made it! If we had kept going on the trail, we would have run right into the cabin, but instead, we walked through the campground looking at the sites. But mainly looking for the water source since we were about out of water. We found it, and it was breathtaking. Pictures don’t do it justice. The small but beautiful waterfall cascaded into a large clear pool where we could get all the cold drinking water we needed (after filtering of course). We refilled our bottles and hydration bladders and relaxed for a few minutes. After filtering water, we went and picked a campsite that we thought looked private. 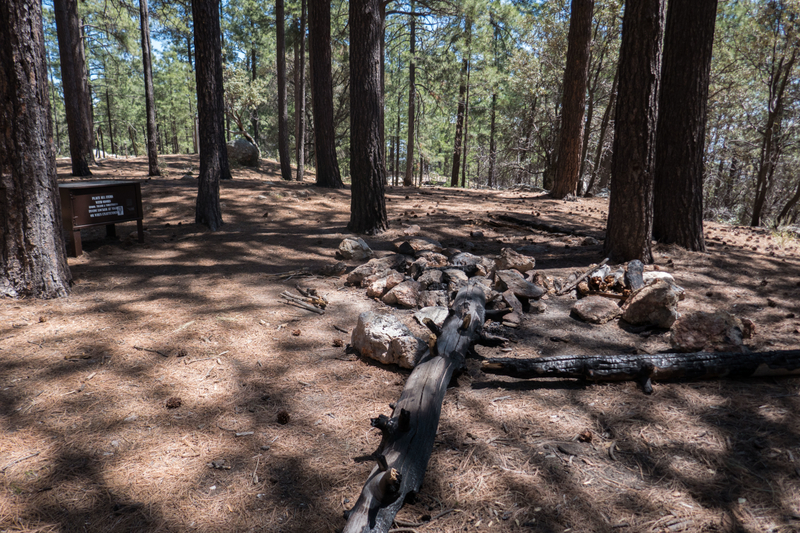 Each campsite had a fire ring and bear box. Then we set about exploring the campground. 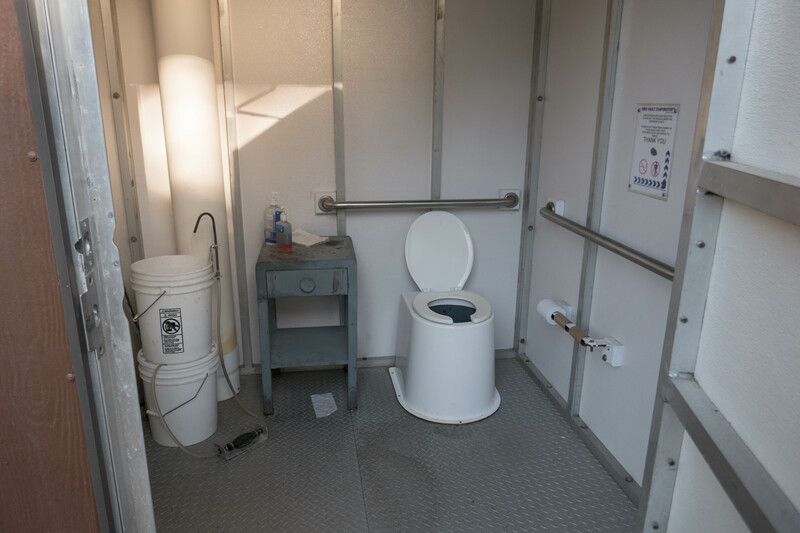 We found the bathrooms, which thankfully had a doors and roofs (comparatively with Happy Valley Campground). The cabin had an open-air section, where we saw lots of gear for the National Park staff that visits the cabin. 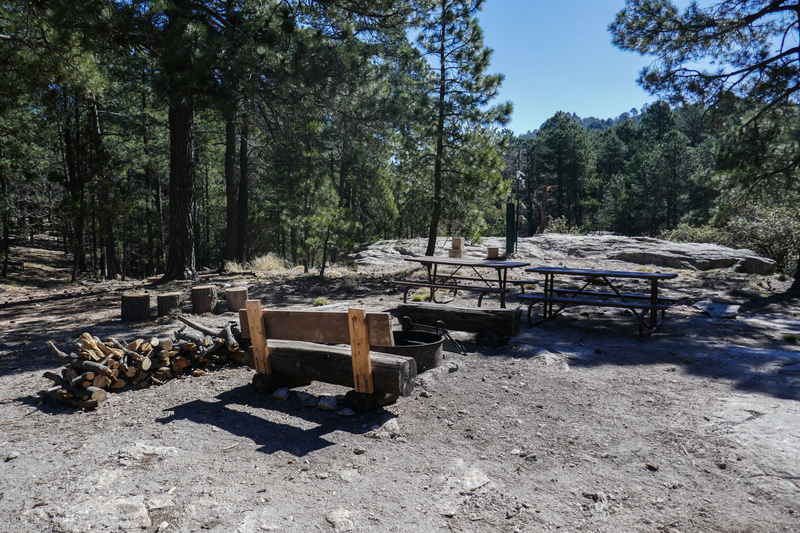 Next to the cabin is a large corral, fire pit, and picnic tables. The original cabin at Manning Camp that was built in 1905. 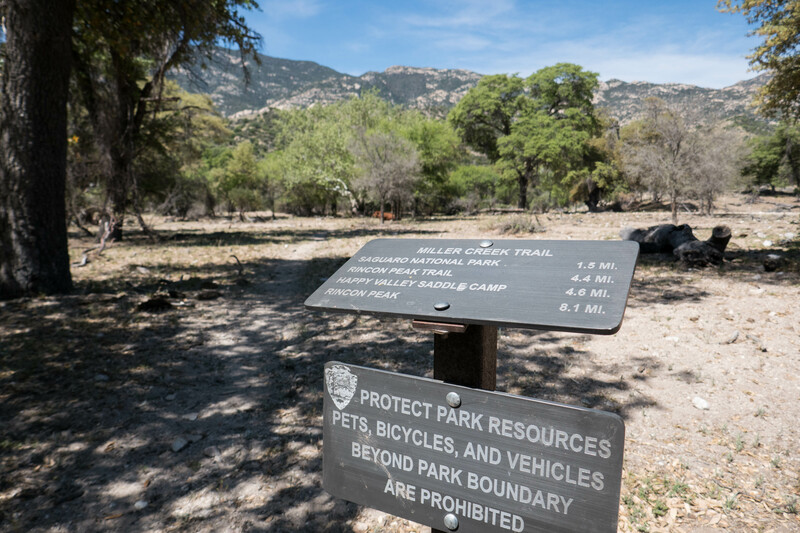 The NPS now uses it to host fire & trail crews, researchers, and rangers. A very pretty water source right at Manning Camp. This is why the camp was established, as water is available year round. 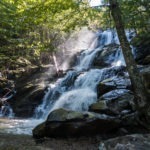 The waterfall is fed from a large pond above the rocks that is inaccessible to campers. At other times of the year, the amount of water is reduced and looks a bit yucky. Our home at Manning Camp, site 2. This picture was taken the next morning. 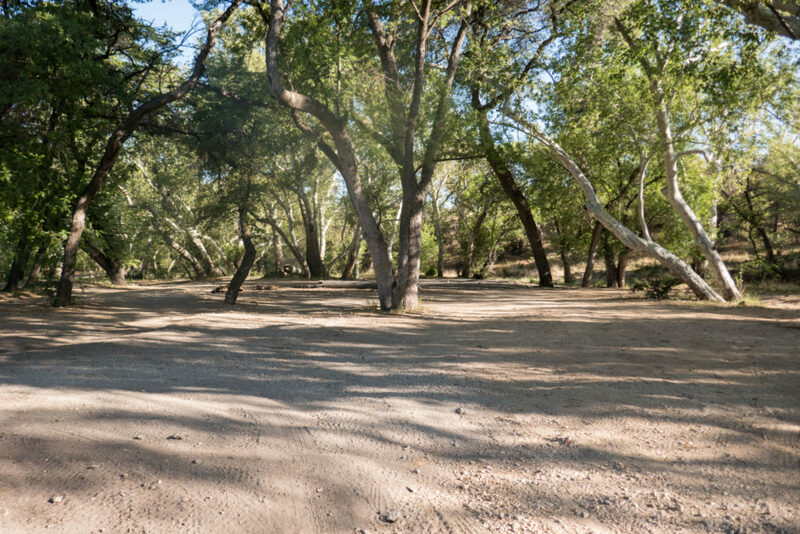 There are 6 campsites and 2 bathrooms at the campground. There are also a few special tents scattered around for NPS employees near Manning Cabin. We chose site 2, as we felt it offered privacy and had some logs for seating. You can’t go wrong with any of the sites though; they all looked private, large, and appeared to have some seating. Apparently there is also a helipad to the west of the camp. One thing we didn’t see? People. Once again, we were the only ones in the campground. We saw a large red tent near the cabin, but not in a campsite, but we never saw anyone use it. We were alone. Not that we minded, but it would have been nice to see other people at some point. After our trip, we asked at a visitor center, and were told an NPS intern should have been staying up there in the cabin. A registry book at Manning Camp told us someone camped there the previous night. Another visitor had written that there was snow a few weeks prior to our visit! The registry book for Manning Camp. Also a copy of “To Kill a Mockingbird” for some reason. Is it weird to take a picture of a bathroom? I’m just glad it had a door. Our initial plan after arriving at Manning Camp was to hike the intersecting trails north of the campground that led to the highest points in Saguaro National Park. Namely, Spud Rock (8613 feet), Mica Mountain (8666 feet), and Reef Rock (8103 feet). We wanted to do a 4.9 mile trail called Fire Loop Trail, that would go past all of them. Even with us pushing ourselves to get to Manning Camp, we still didn’t have quite enough time before it started to get dark. But we did have enough time to hike to Spud Rock. 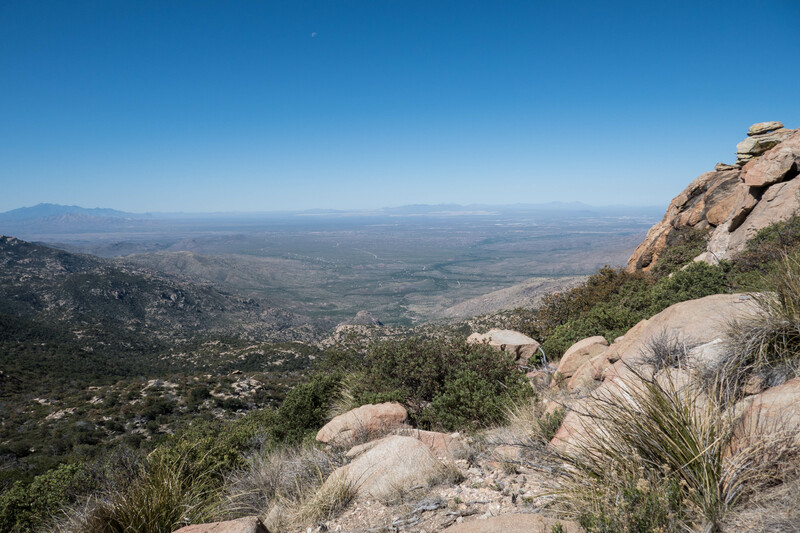 Mica Mountain may be slightly taller, but I had read that Spud Rock has better views. Kristin and I grabbed some energy chews and water, then walked through camp past the cabin. We turned onto Cowhead Saddle Trail, which turned right onto Fire Loop Trail in 0.6 miles. We went around the loop clockwise, and the hike wasn’t too bad – it would only be 2.5 miles roundtrip. Not being very good at judging distance, we kept suggesting that every big rock that we saw was Spud Rock. In reality, we didn’t see Spud Rock coming. Spud Rock is about 1.4 miles from Manning Camp. We started out on Cowhead Saddle Trail, which led to Fire Loop Trail. We’ve arrived at 8613 feet. Well, almost. At about 1.4 miles into the hike, we came upon a simple sign that marked Spud Rock, with an enormous rock outcropping behind it. Did it look like a potato? Not to us, at least from that vantage point. According to the book “Arizona Place Names” by Will C. Barnes: “Two Southern Pacific railroad engineers, William H. Barnett and Jim Miller, had a shack here and raised potatoes and cabbage on a little flat close to the rock. They called it Spud Rock for their major crop – spuds.” There was no official trail that went to the top, but there was clearly a social trail. So we followed it. It doesn’t take that long, just 5 or so minutes to climb. Near the top we climbed up a decently sloped rock slab, but it wasn’t too bad. At the top was a flat-ish area, where we were greeted by immense gusts of wind. Not surprising considering how high we were. We were also wowed by spectacular views that took our breath away, despite it being hazy. We snapped a few quick photos while trying not to get blown away. 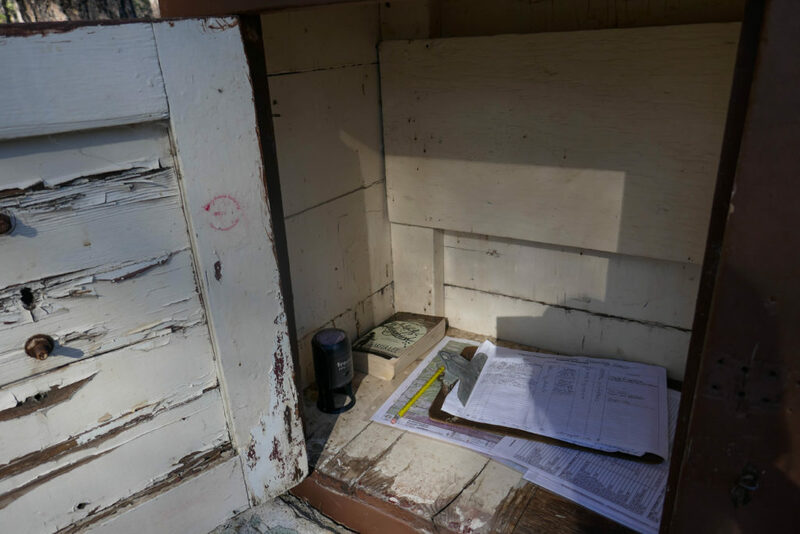 Also at the top is a logbook in an ammo box, surrounded by rocks to protect it from the wind. We had to duck to sign the logbook, and then climbed back down. The hike back to Manning Camp didn’t take long, and we were back before we knew it. We settled in, made some dinner, and were exhausted so went to sleep shortly after. It had also gotten pretty cold out. We were happy to have our jackets and long hiking pants. I don’t know the exact temperature, but it was probably in the low 40s (°F). There was a fire ring, but we didn’t feel like going through the hassle of making a fire, when we could just crawl into the tent and get warm instead. Sleep came easily. The great view out from Spud Rock. Definitely was a bit hazy. Another view out from Spud Rock. In the background is Rincon Peak! It was still cold when we got up around 7 a.m. The average low at Manning Camp in April was 37°F! It started warming up slowly, as the sun rose in the sky. With a long day ahead, we made some oatmeal for breakfast and started packing up. You can never have too much water, so we went back to the water source to fill up. As we were filtering, we hear a noise beyond the water, and were startled to see, of all things, a turkey. 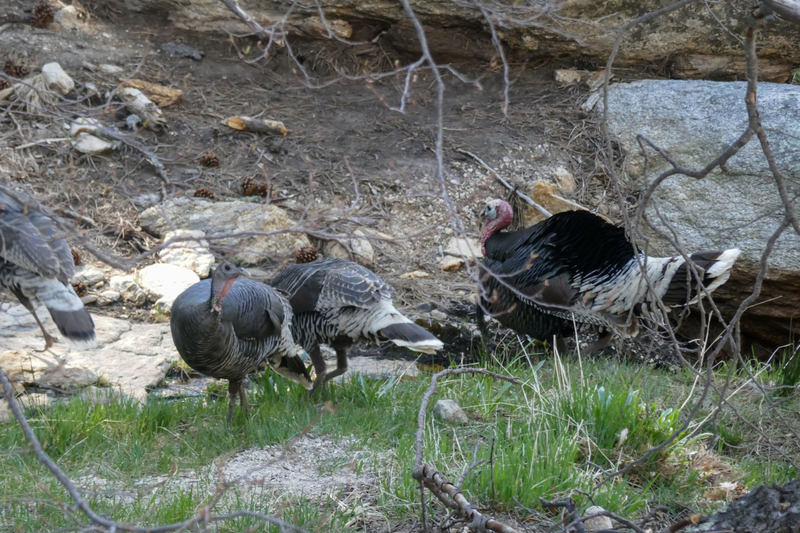 The large adult male turkey was covered with feathers and weird wrinkly appendages. Not what we expected! But then we remembered the name of the trail we would be on later that day – Turkey Creek. Of course. Was it a good sign for the day? The turkey flew across the small creek downstream from the waterfall, coming closer to us. That’s when we noticed that the turkey wasn’t alone. There were about 10 female turkeys all throughout the campground. The turkeys wandered around in the campground for a good 20 minutes, while we filtered water and packed up. After saying goodbye to our turkey friends, we walked past Manning Cabin toward Fire Loop Trail. 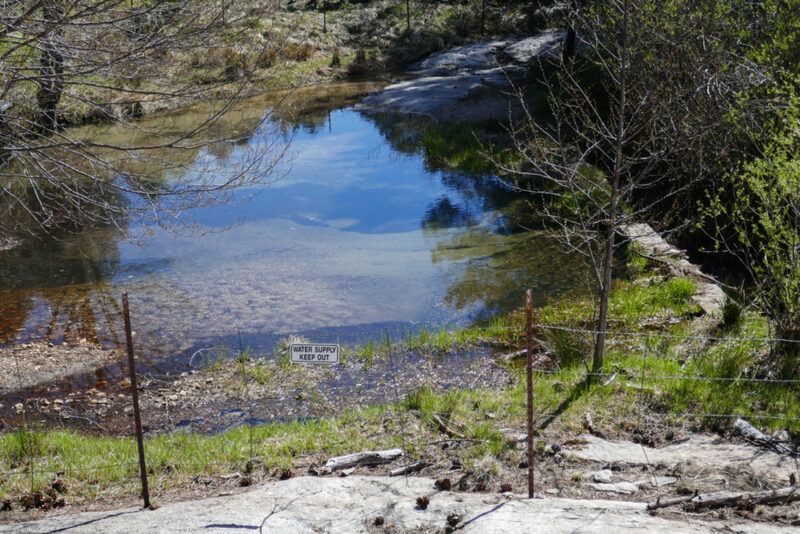 On the way out, we also saw the “pond” that feeds the campground’s water source. There’s a fence, so you can’t access it from the top, but you can see it running through the rock into the pool below. After checking it out, we left Manning Camp and went east along Fire Loop Trail. It was going to be a long day with 9.9 miles and 4,817 feet elevation loss. Initially, the trail was a bit elusive due to downed trees and poor signage. There were pine needles littering the ground, so we had to be cautious to avoid slipping. We crossed several small trickles and pools of water. Probably not enough to get drinking water without a pump. Initially, the trail ascends slightly before starting our big descent. Fire Loop Trail runs into our old friend, Heartbreak Ridge Trail. This time we were only on it for 0.9 miles before going on a few smaller trails like Switchback and East Slope Trails. 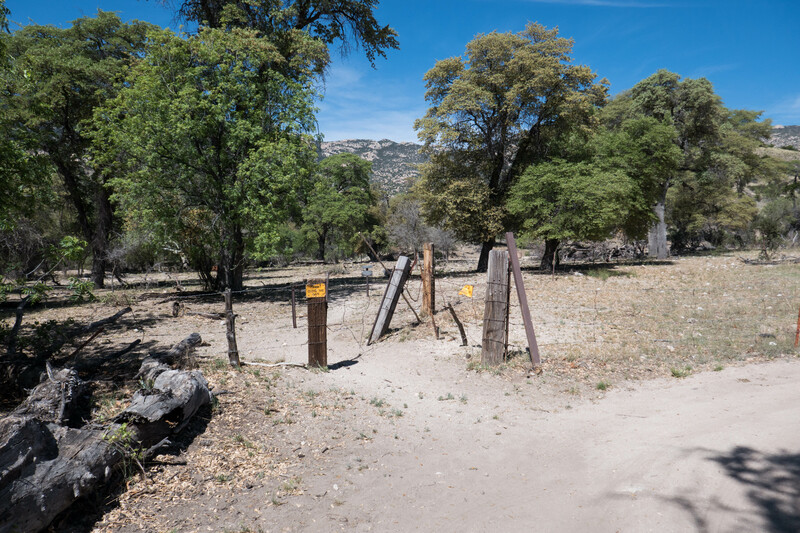 At the terminus of East Slope Trail is Spud Rock campground. We were close enough, so we decide to go check it out. Really, we wanted to find out if the bathroom there is also three-sided like Happy Valley Campground. It was a bit tough locating the campsites themselves, but when we did, they reminded us of Happy Valley Campground with pine trees towering above. And like Happy Valley, the bathroom was indeed 3-sided. And leaning! Lovely view down a hill though, if that matters to you. There’s supposed to be a spring somewhere in the campground, but we didn’t have time to look for it. Spud Rock Campground campsite. Of course there’s a bear box! 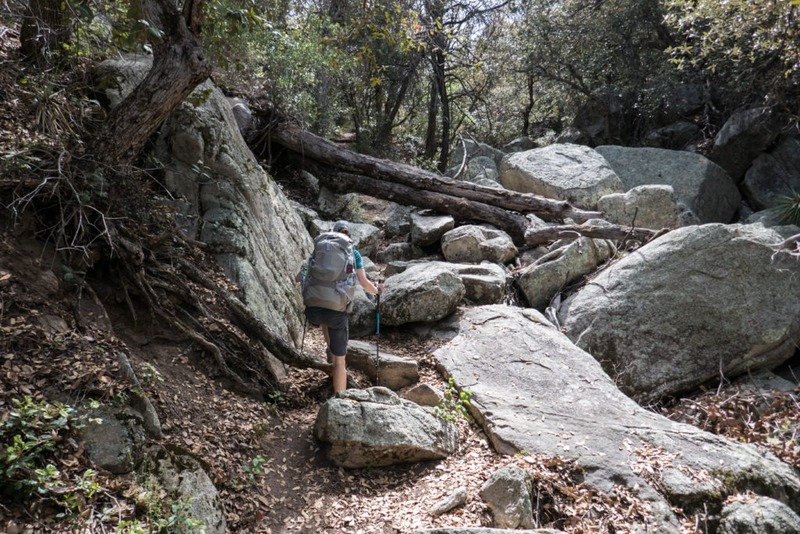 Leaving Spud Rock Campground, we continued on Deerhead Spring Trail which connected with Turkey Creek Trail. Deerhead Spring itself is located along Turkey Creek Trail. It didn’t look like a ton of water, but you might be able to search to find some. This part of the trail descended steeply, with very slippery, eroded and overgrown trails. It could benefit from some maintenance, but since not many backpackers visit, they probably don’t have the budget or incentive. 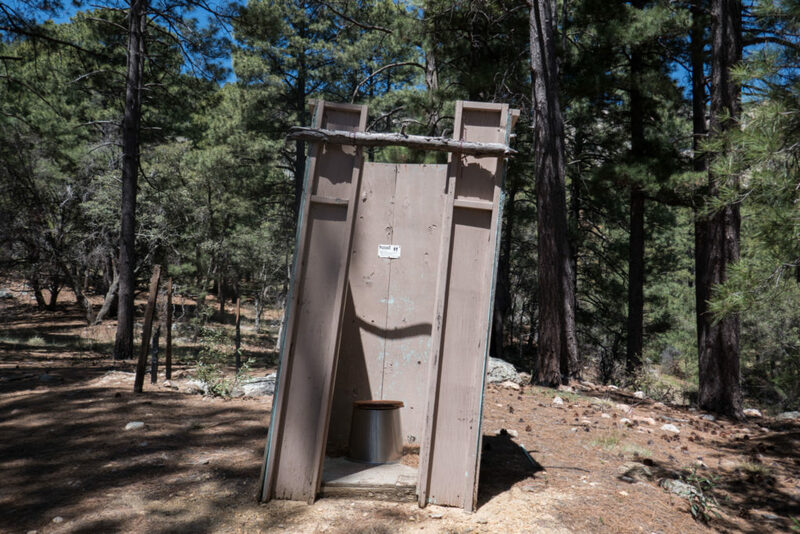 In 2017 there were only 2,339 backcountry campers in Saguaro NP; 50% of those visited in March or April. We crossed between sunny and wooded areas as we looked for markers and small cairns to guide us. We stopped for a lunch break along the trail, and realized we were running a bit low on food. It was also here that I somehow smudged my camera lens and didn’t notice until we got back from the trip that all my pictures also had a smudge from this point on. Whoops. If you see it in future pictures, that’s why. Continuing on, we had great views along the trail that we enjoyed. The trail was dusty, gritty and slippery, and we were beyond tired. But we still were having a blast. We tried to hike quickly to make good time. The start of the long Turkey Creek Trail. It says 6.2 miles to Turkey Creek Trailhead, but from the park-provided GIS data it’s actually around 6.5 miles. Look at that eroded trail. Makes it a bit slippery and we had to be careful going down. This was one of many stunning views that greeted us as we descended. After 3.1 miles on Turkey Creek Trail, we reached the boundary with Saguaro National Park and Coronado National Forest. Our surroundings started to change too, and we found ourselves hiking through a picturesque grassland. Once again, not what we expected. We hiked through it as the winds rustled the grasses, and we felt as though we had been magically transported somewhere else. Soon, we spotted the end of Turkey Creek Trail. Well, in a way. The trail ends and Turkey Creek Springs Road (Forest Road #4408), a 4 wheel drive road (4WD), takes over. 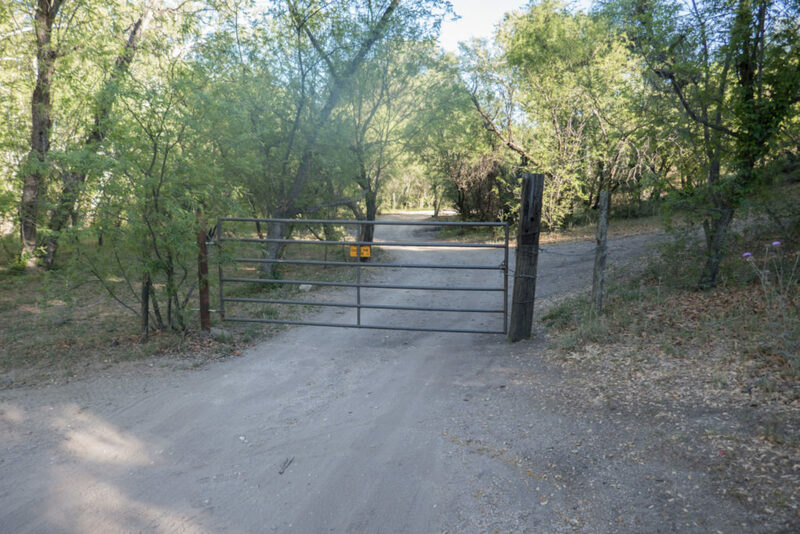 On most maps, the road isn’t considered part of Turkey Creek Trail, though there is a trailhead sign near the end of the road that includes the road as part of the trail. Either way, it was about 1.8 miles on Turkey Creek Spring Road to Happy Valley Road. Not expecting much from a dirt road, we were surprised when it had great views. It definitely is a 4WD road…I wouldn’t take our 2WD Nissan Rogue on it. We munched on some Clif Bar energy chews as we hiked, the last of our food. We had more food in the car, so we just had to get there. Goodbye to Saguaro National Park, and hello again to Coronado National Forest. This is the boundary gate that keeps cattle out of the park. This isn’t what we imagined this trail would be like. We’re in a grassland! And there’s the marker for the end of Turkey Creek Trail. Or the starting trailhead if you hike the opposite way. On the other side of the marker is Turkey Creek Spring Road. Yes, there are even good views along the 4WD road (Turkey Creek Spring Rd)! The small black dot in the upper left is a bird of some sort. The 4WD road ended in a circular area with a grove of trees. 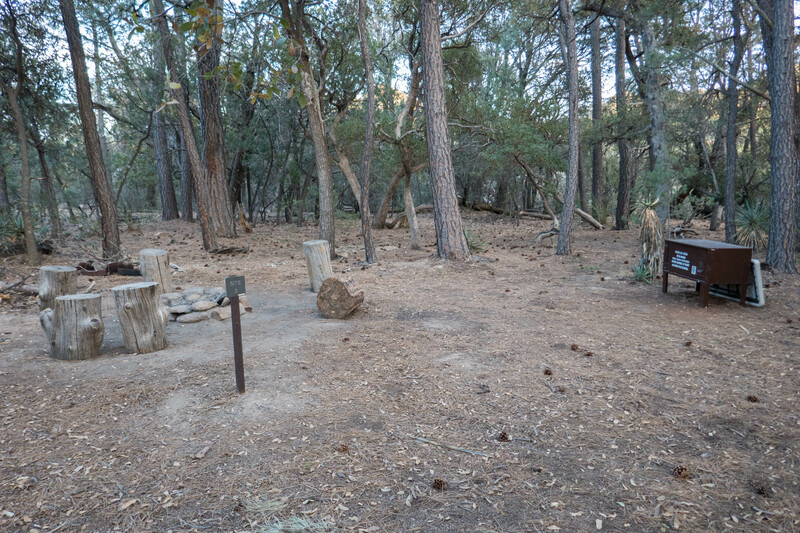 It looked like there were a few primitive campsites that people had used around the area. It was tricky to figure out which way to go, so we wandered around until we came upon a metal gate. 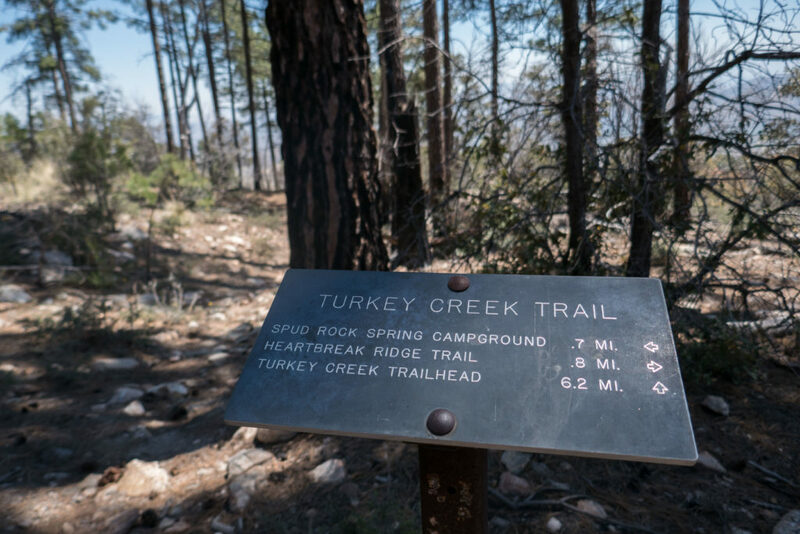 We knew we were headed the right way when we saw a sign pointing to the Turkey Creek Trailhead. Before we knew it, we were on Happy Valley Road (Forest Road #35). A 10-minute walk along the road led us back to Miller Creek Trailhead, where we started. We were overjoyed to see our car, and grab a well-deserved snack. Our car was no longer lonely either, someone else had parked next to us. And yet we never saw another person during the trip. So exhausted. Our minds and bodies were shot at this point with the heat and distance. All we wanted to do was sleep. And eat. It was confusing. As we drove back to Tucson we snacked on Sun Chips and jerky. The drive back was uneventful. The water we had passed through on the way there had subsided, so it was easier to cross. 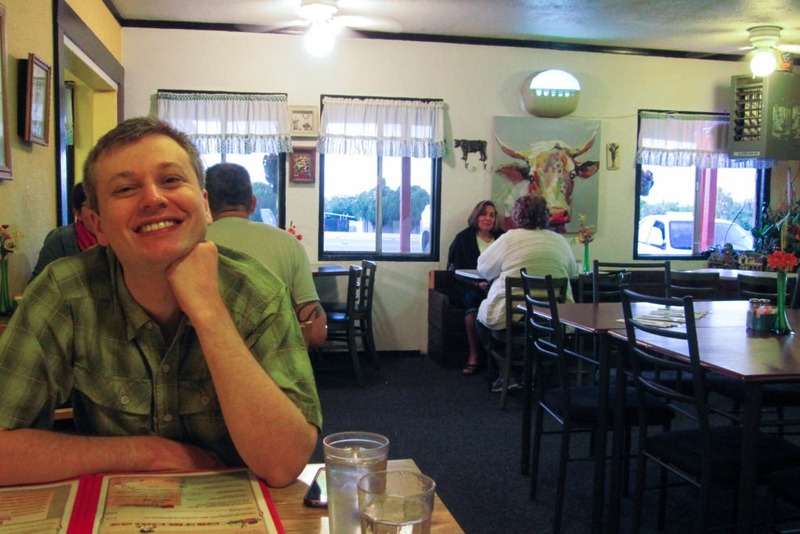 Once in Tucson, we stopped at El Guero Canelo and got our first Sonoran Hotdogs. Then we went to our hotel, the Comfort Suites at Sabino Canyon, showered, and passed out. Looking back at the end of Turkey Creek Spring Road. There’s a small trailhead marker detailing mileages. Primitive campsites near the end/start of the 4WD road. On Happy Valley Road, walking from Turkey Creek Trailhead to Miller Creek Trailhead. 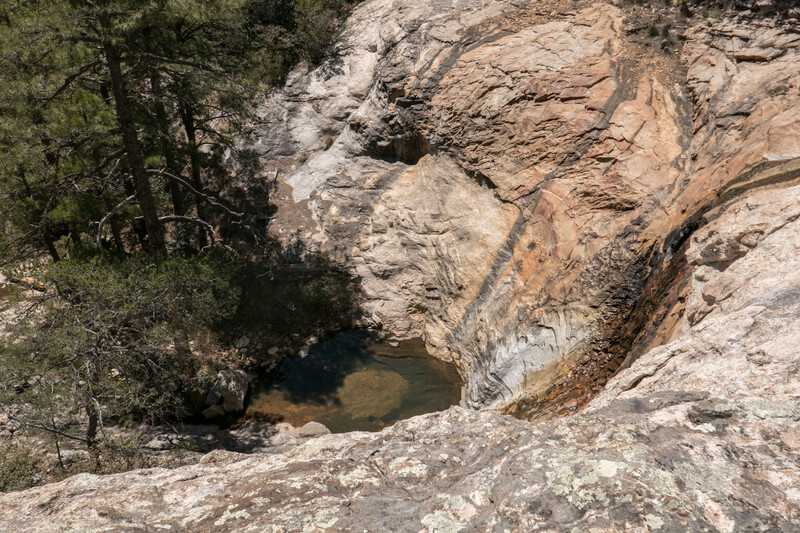 Day 4 – Hike trails around Manning Camp, see Spud Rock, Mica Mountain, and Reef Rock. Camp at Manning Camp. That’s our preferred route, if you can figure out how to get additional water at Happy Valley. If not, I would do a 4-day trip, cut the side trail to Rincon Peak, and stay two nights at Manning Camp. If you don’t have four or five days, we can happily say our three day trip was well worth it. 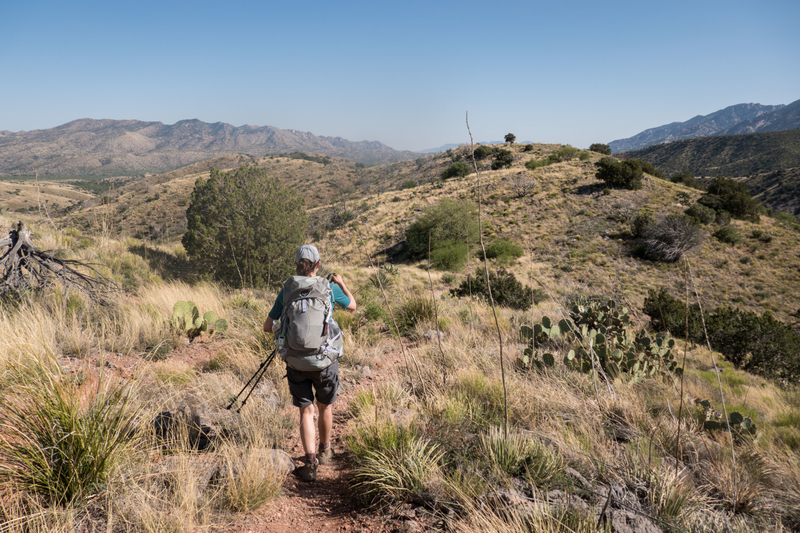 Saguaro National Park surprised us, time and time again, and this backpacking trip was no exception. We’ll be back. Trail Markings: There are infrequent cairns and red metal markers usually pounded into trees. Signs at intersections. Trail is not well defined in some areas. Sticks are placed in areas to mark the “wrong way.” We usually found that following the sand led us the right way. Crowds: None. We saw absolutely no one on this 3-day backpacking trip. Water: A small stream near the start of Miller Creek Trail, and then a stream that is coming down from the Manning Camp water source. Mile 0.0 – From the parking area at Miller Creek, you’ll see a fence to your west. Go through it, making sure to close it on your way. 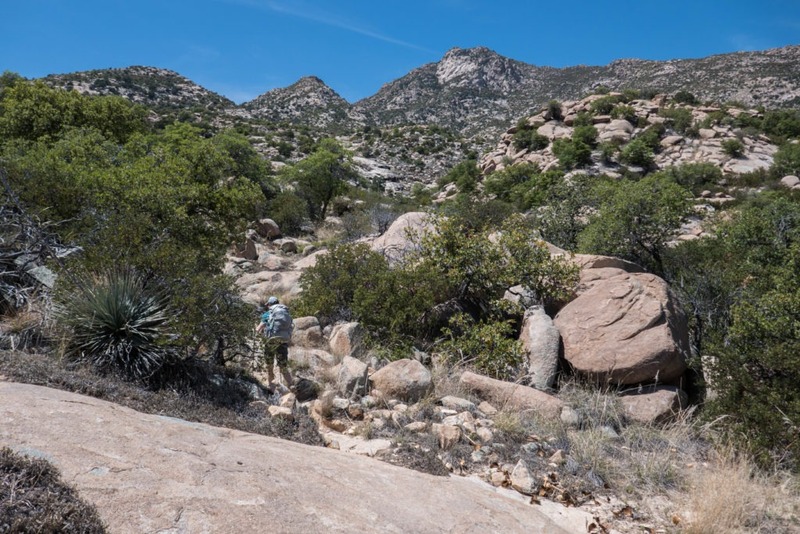 This is the Miller Creek Trail, through Coronado National Forest. You’ll pass cows, and go up a slight incline. You might see some small pools and streams of water. I’d stay away from it with all the cows around though. 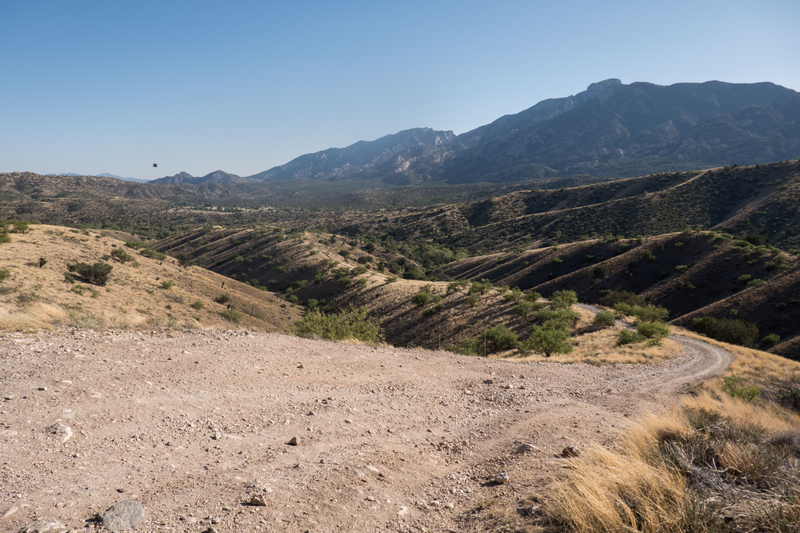 Mile 1.3 – You’ll see a sign and fence indicating you’re entering Saguaro National Park. Again, make sure to close the fence, and continue on the Miller Creek Trail. This next section is more steep and eroded. Mile 3.9 – You’ve reached the intersection with Heartbreak Ridge Trail! You’re almost there. Turn left onto the trail, and you’ll be rewarded with small downhill section. As you’ve noticed, there are a lot of trees in this area, compared to the earlier parts of Miller Creek Trail. 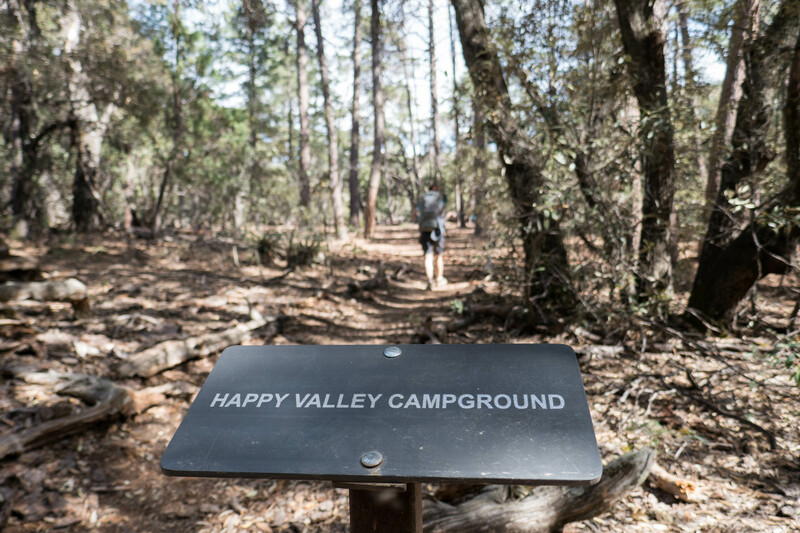 Mile 4.1 – Keep an eye out on the left for a Happy Valley Campground sign. Stay the night here (make sure you have a reservation). Site 3 is the best, imo. The next day, go back the way you came. Mile 4.3 – You’re back to the intersection with Heartbreak Ridge and Miller Creek Trails. This time, continue straight. This section becomes more exposed to the sun again, leaving behind the big trees. You’ll also start to climb steeply in elevation. Mile 6.1 – To your right is a short trail to Happy Valley Lookout. We didn’t go up there because of time constraints, but my understanding is that there is an old fire tower there (or was). Go check it out if you wish, it’s only 0.4 mi round-trip. If not, continue straight on Heartbreak Ridge Trail. The trail starts to go up and down and level out a bit occasionally. 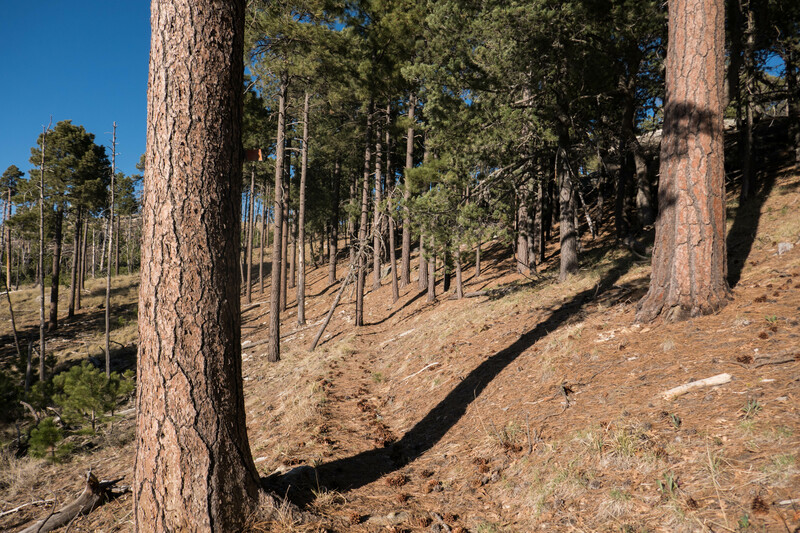 Mile 7.8 – Pass Deerhead Spring Trail on the right, and continue straight on Heartbreak Ridge Trail. Mile 8.3 – You’ve reached “Four Corners,” where the Heartbreak Ridge, East Slope, and Devil’s Bathtub Trails converge. Head left on Devil’s Bathtub Trail. Mile 8.9 – Finally! Your first water since yesterday. On the left is the Devil’s Bathtub. I’d only recommend getting water if you’re desperate, you’re almost to a better source at Manning Camp. Mile 9.5 – Turn right at the intersection, onto Manning Camp Trail. 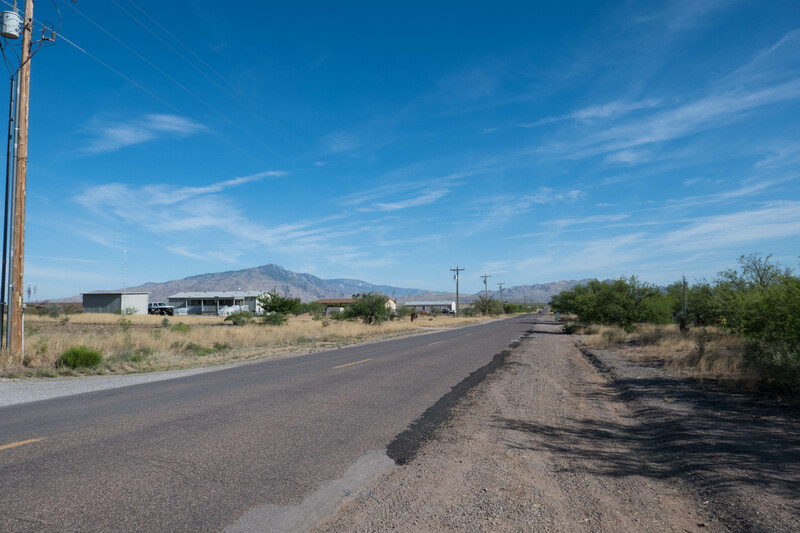 Mile 10.5 – You’ll see Manning Camp on your right, you’ll pretty much run right into it. Stay the night here, and enjoy it. If you have time, explore the trails around Manning Camp. Even better, stay another night to hike the trails the following day. Whenever you leave Manning Camp, head east on Fire Loop Trail. There’s a bit more of an uphill climb, until you begin the long descent. 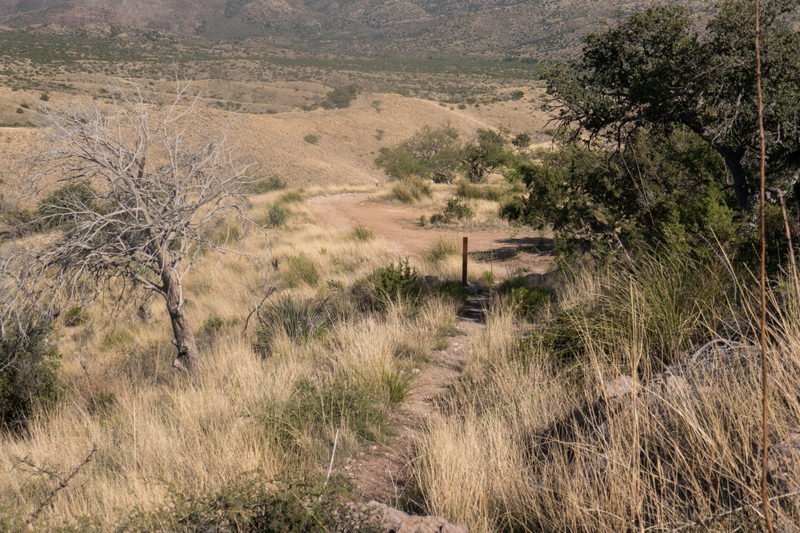 Mile 10.7 – An intersection with Mica Mountain Trail. Continue straight on Fire Loop Trail. On this section, keep on eye out on the left for Duckbill mountain top. We neglected to look for it when we did the trail. 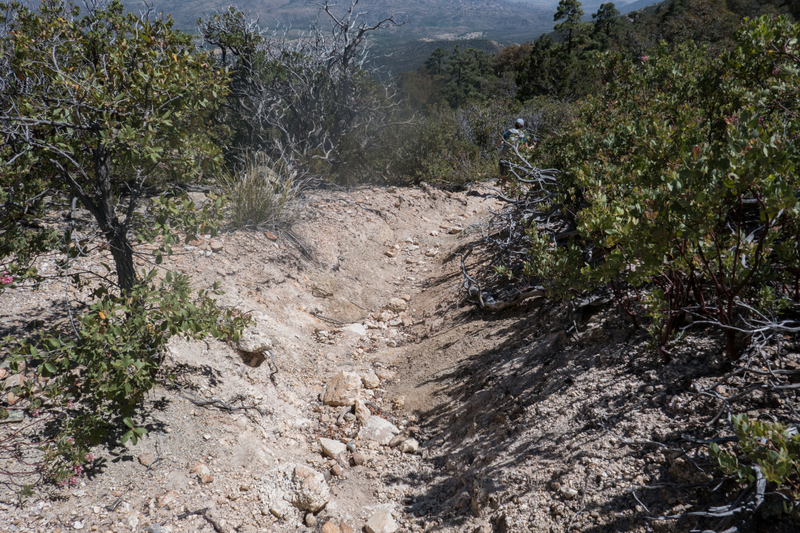 Mile 11.1 – Head right at the fork, going onto the Heartbreak Ridge Trail. The trail starts descending here. Mile 12.0 – At the intersection, go left onto Switchback Trail instead of continuing on Heartbreak Ridge Trail. Mile 12.4 – Turn left onto East Slope Trail. Mile 12.5 – At this intersection with East Slope and Deerhead Spring Trails, there’s also a short trail to Spud Rock Campground. Check it out, or continue onto Deerhead Spring Trail. Mile 12.9 – You’ve reached Turkey Creek Trail. You’ll more or less be on this for the rest of the trip. This is also where the bulk of your descent is. 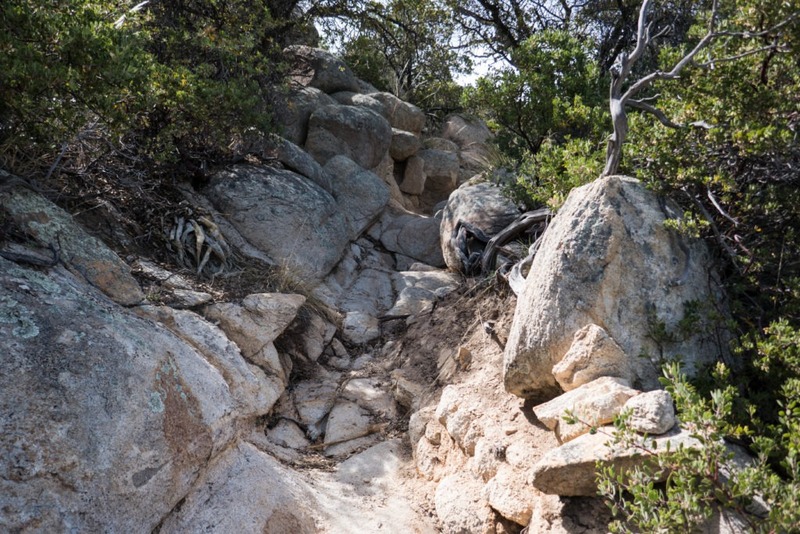 Be careful because the trail is eroded and steep. Follow cairns as needed. You’ll come out of the trees too into more open areas. 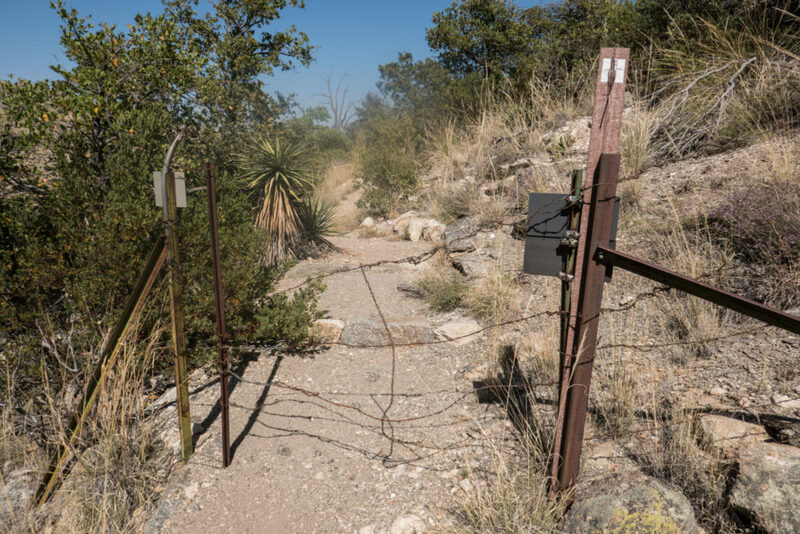 Mile 15.2 – You’ll see a fence, meaning you’ve come to the end of the Saguaro National Park Boundary. 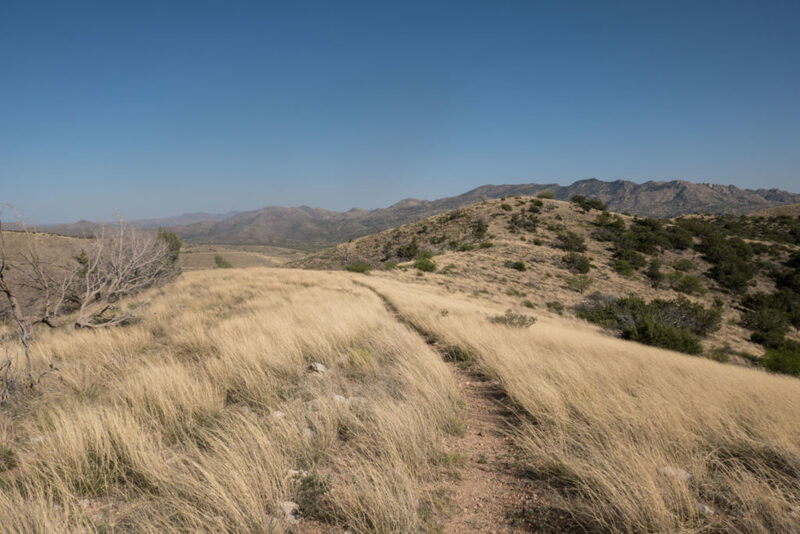 Go through it, and continue on the trail in Coronado National Forest. You’ll see your environment start to change as you enter into more of a grassland. It’s not quite as steep here, but you’ll still descend. Mile 17.9 – The end of Turkey Creek Trail. Continue straight on the Turkey Spring Road, a 4WD Road (Forest Road #4408). It has great views! Mile 19.4 – The 4WD road ends, and you come to a primitive campsite area. We got a bit lost here;, exit through a metal gate and follow the dirt road. Mile 19.8 – The road ends in a T intersection. To the left and right is Happy Valley Road (Forest Road #35). Go right. 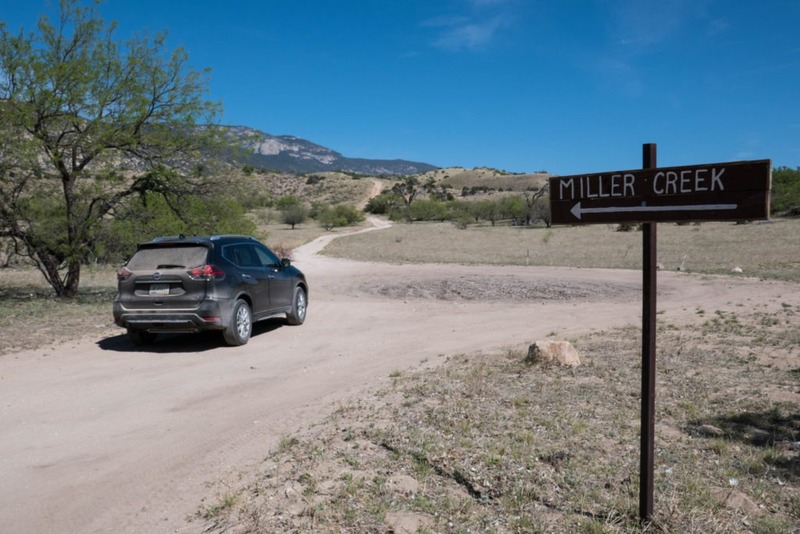 Mile 20.2 – On your right is the road to Miller Creek Trailhead, almost there. Head down the road. Mile 20.4 – You’re back where you started.